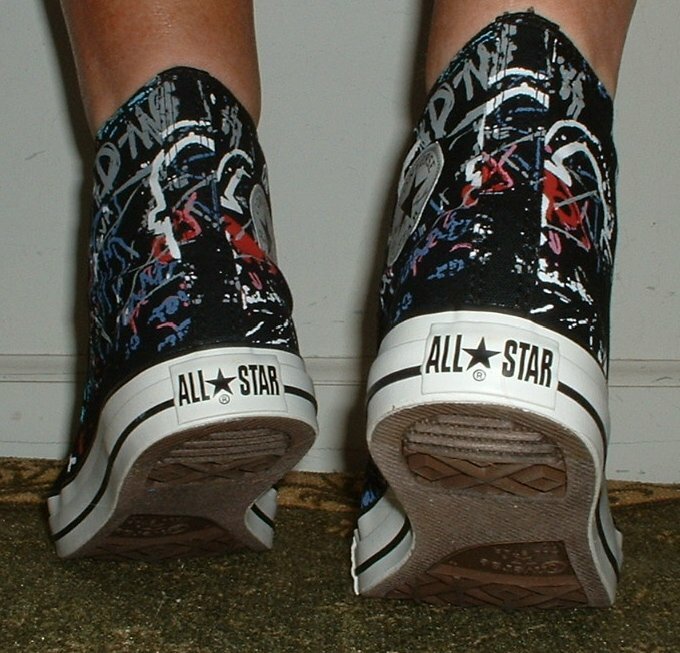 Photo gallery of print high top chucks that are a tribute to specific bands or rock music in general. 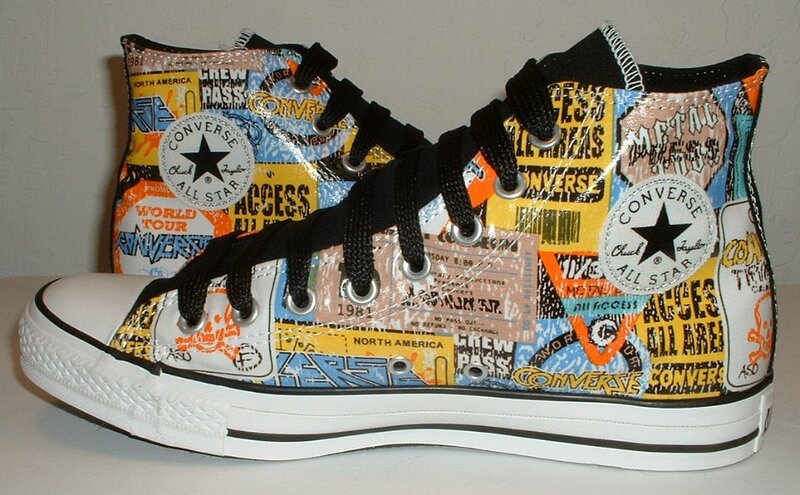 1 Rock and Roll High Top Chucks Right inside patch view of a coated backstage pass print high top. 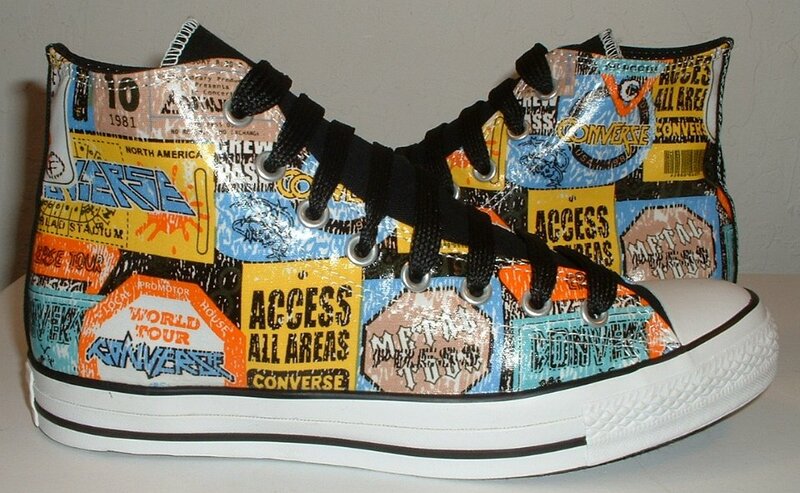 2 Rock and Roll High Top Chucks Right outside view of a coated backstage pass print high top. 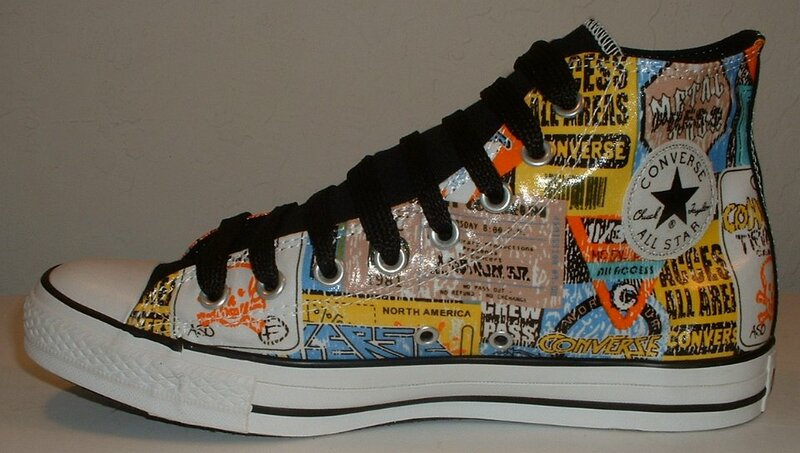 3 Rock and Roll High Top Chucks Left inside patch view of a coated backstage pass print high top. 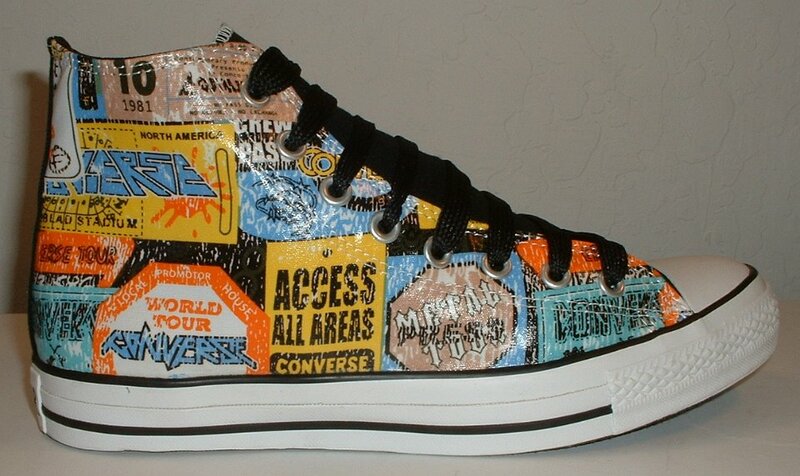 4 Rock and Roll High Top Chucks Left outside view of a coated backstage pass print high top. 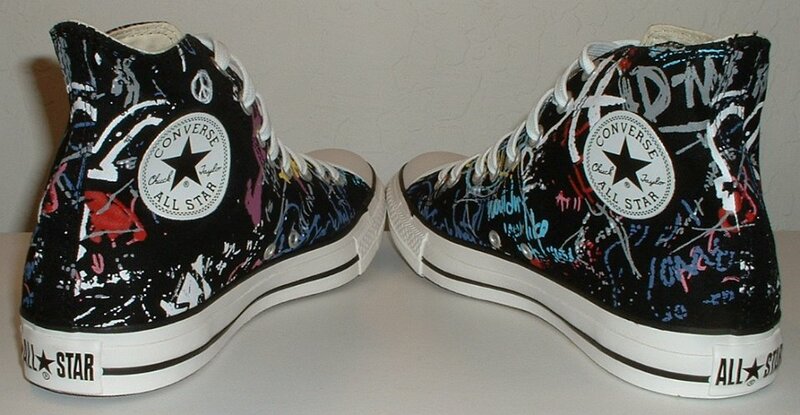 5 Rock and Roll High Top Chucks Rear view of coated backstage pass print high tops. 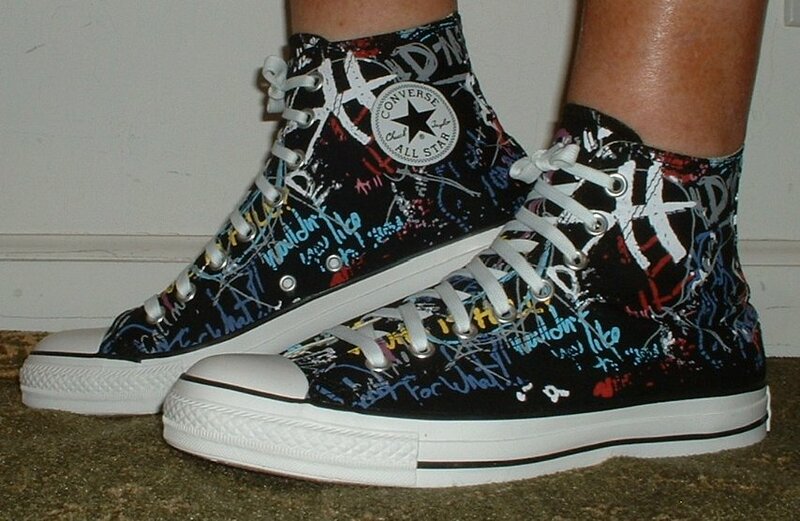 6 Rock and Roll High Top Chucks Angled rear view of coated backstage pass print high tops. 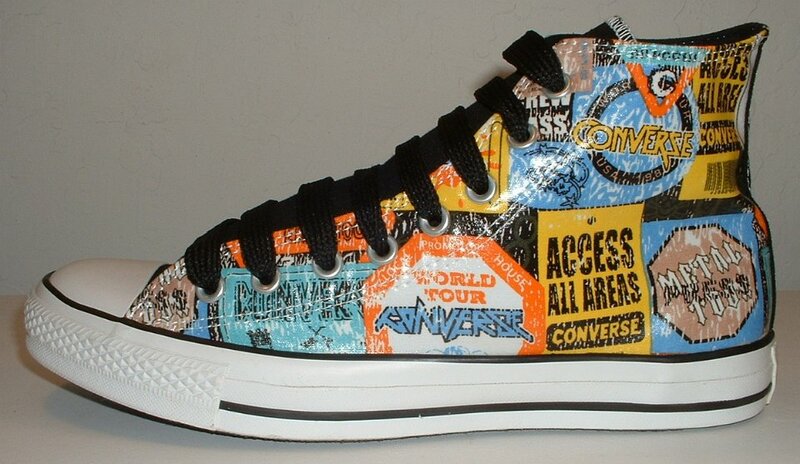 7 Rock and Roll High Top Chucks Angled side view of coated backstage pass print high tops. 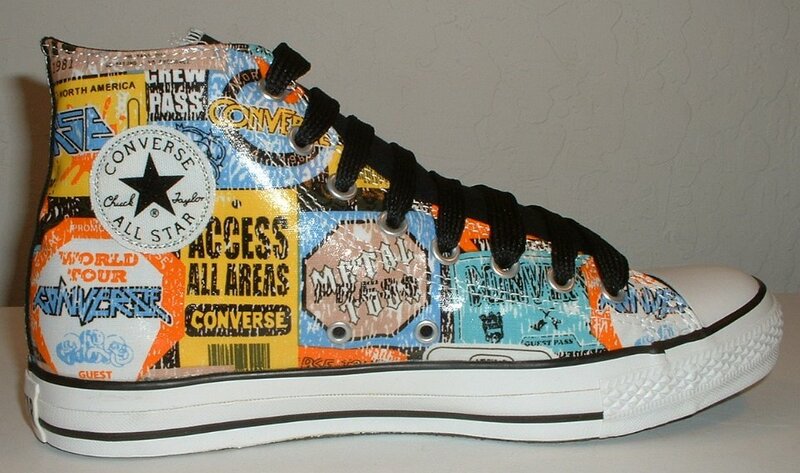 8 Rock and Roll High Top Chucks Front view of coated backstage pass print high tops. 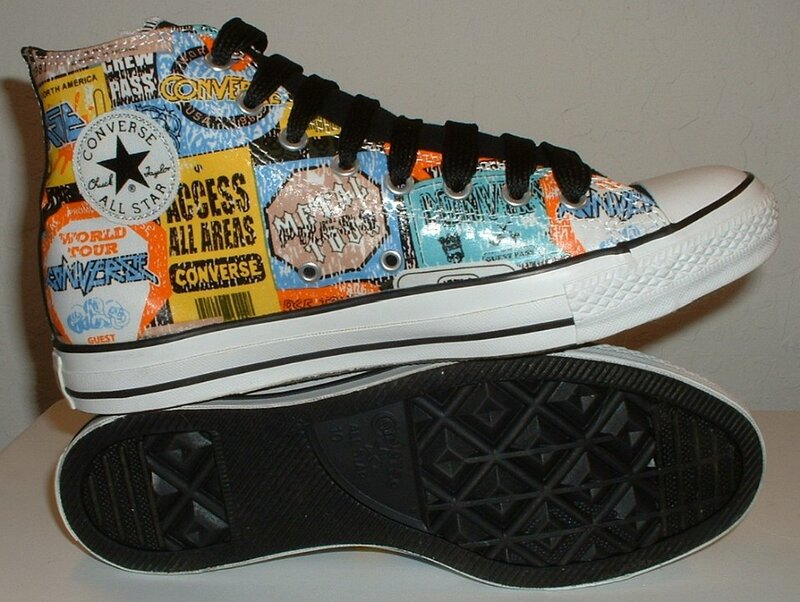 9 Rock and Roll High Top Chucks Inside patch views of coated backstage pass print high tops. 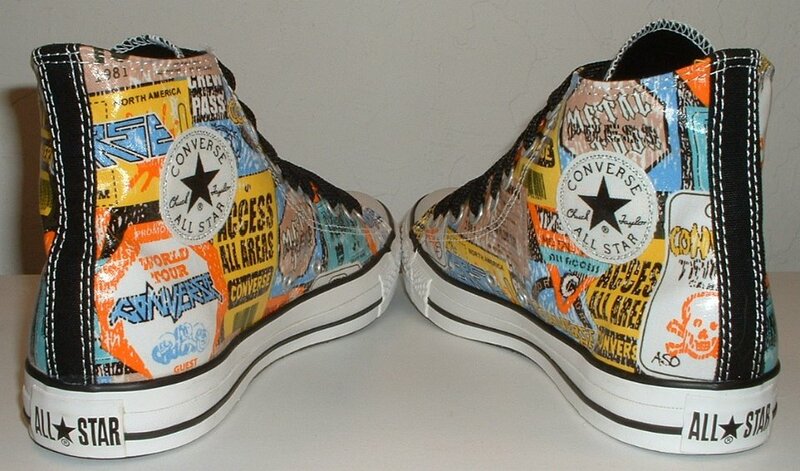 10 Rock and Roll High Top Chucks Top view of coated backstage pass print high tops. 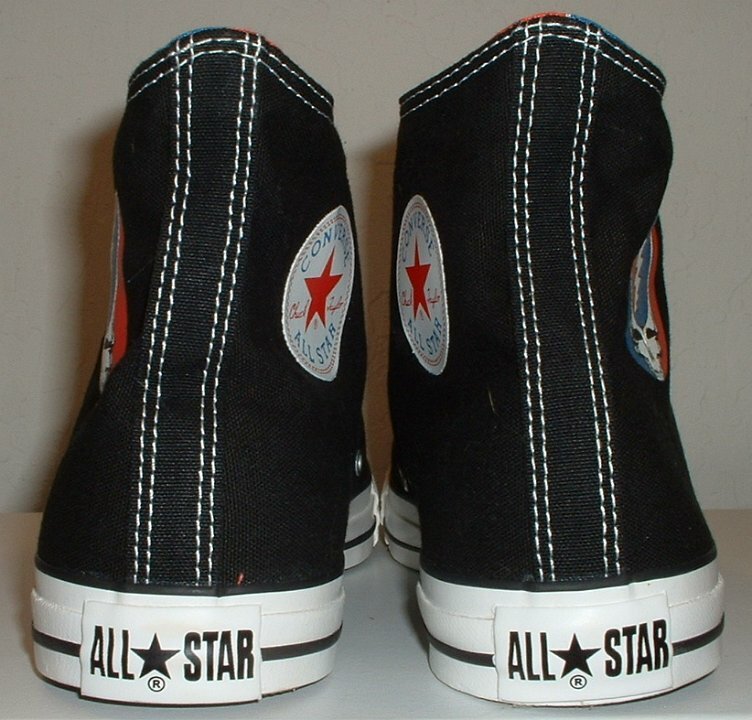 11 Rock and Roll High Top Chucks Inside patch views of coated backstage pass print high tops. 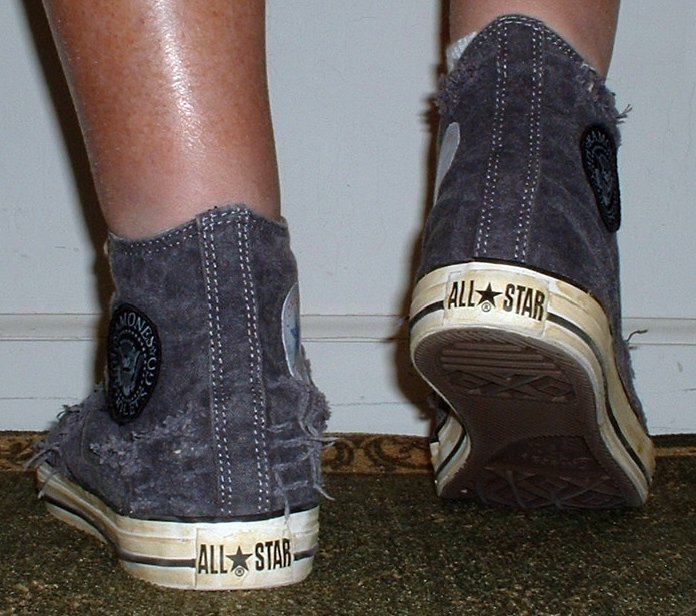 12 Rock and Roll High Top Chucks Outside views of coated backstage pass print high tops. 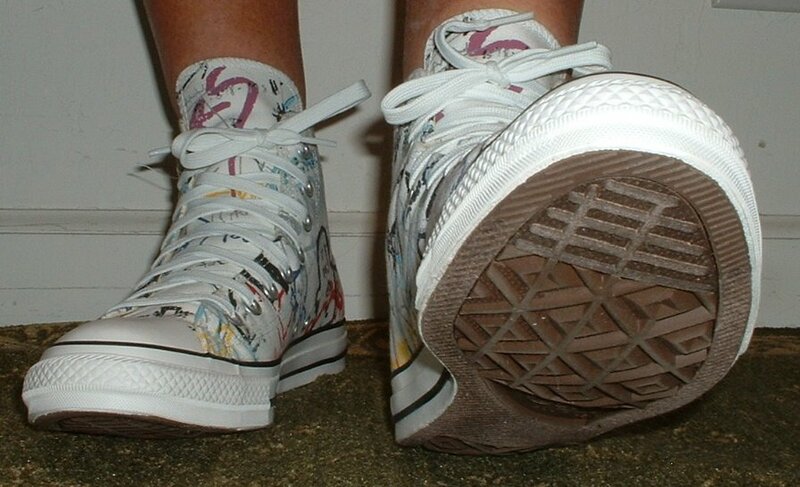 13 Rock and Roll High Top Chucks inside patch and sole views of coated backstage pass print high tops. 14 Rock and Roll High Top Chucks nside patch view of a right black punk print high top. 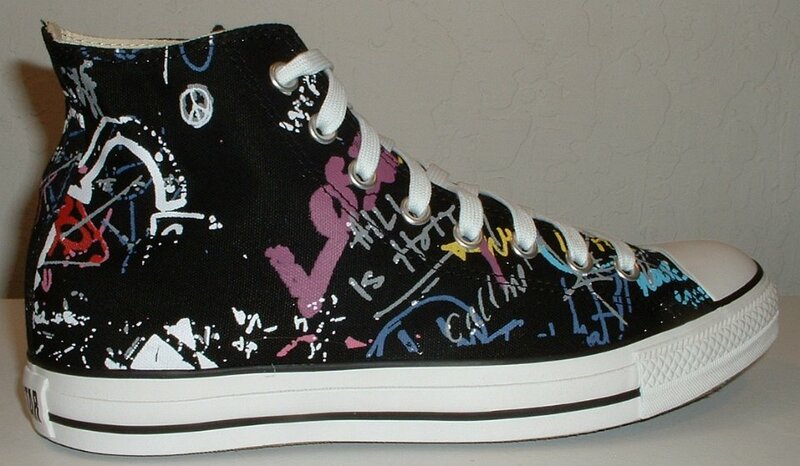 15 Rock and Roll High Top Chucks Outside view of a right black punk print high top. 16 Rock and Roll High Top Chucks Inside patch view of a left black punk print high top. 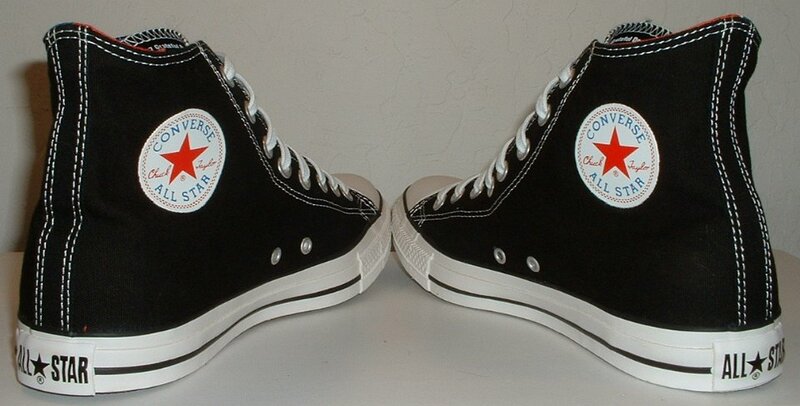 17 Rock and Roll High Top Chucks Outside view of a left black punk print high top. 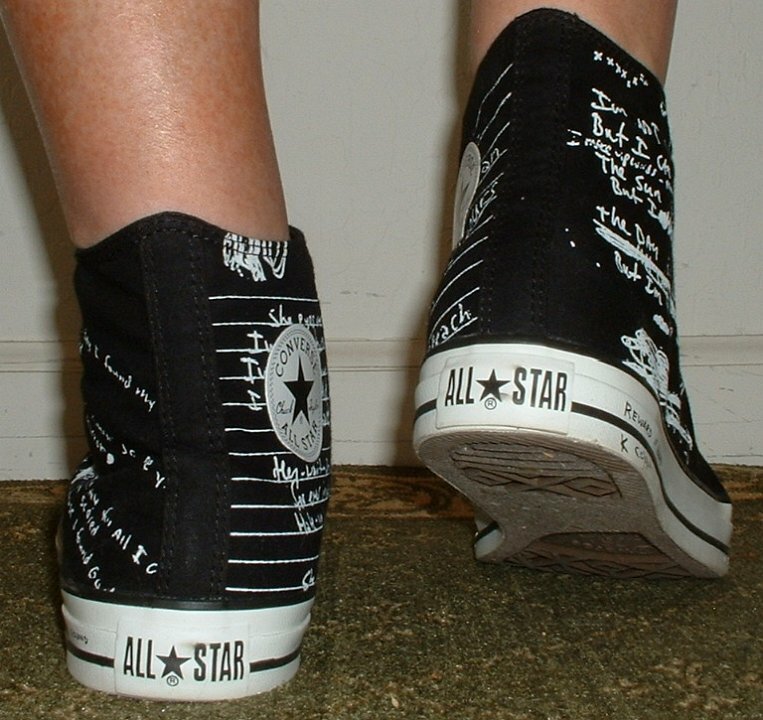 18 Rock and Roll High Top Chucks Rear view of black punk print high tops. 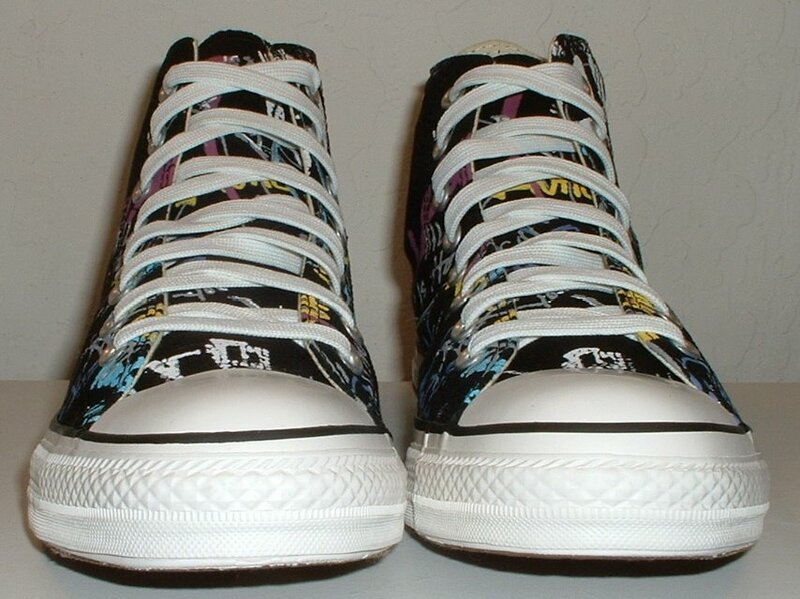 19 Rock and Roll High Top Chucks Angled rear view of black punk print high tops. 20 Rock and Roll High Top Chucks Angled side view of black punk print high tops. 21 Rock and Roll High Top Chucks Front view of black punk print high tops. 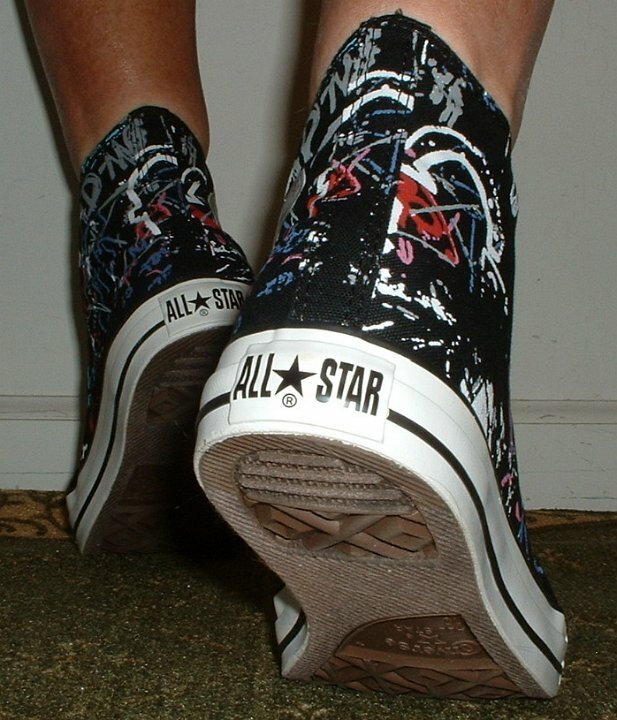 22 Rock and Roll High Top Chucks Angled inside patch views of black punk print high tops. 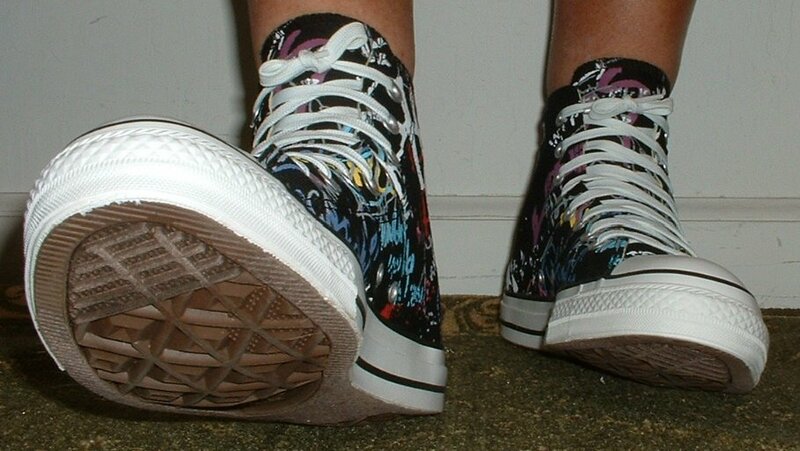 23 Rock and Roll High Top Chucks Top view of black punk print high tops. 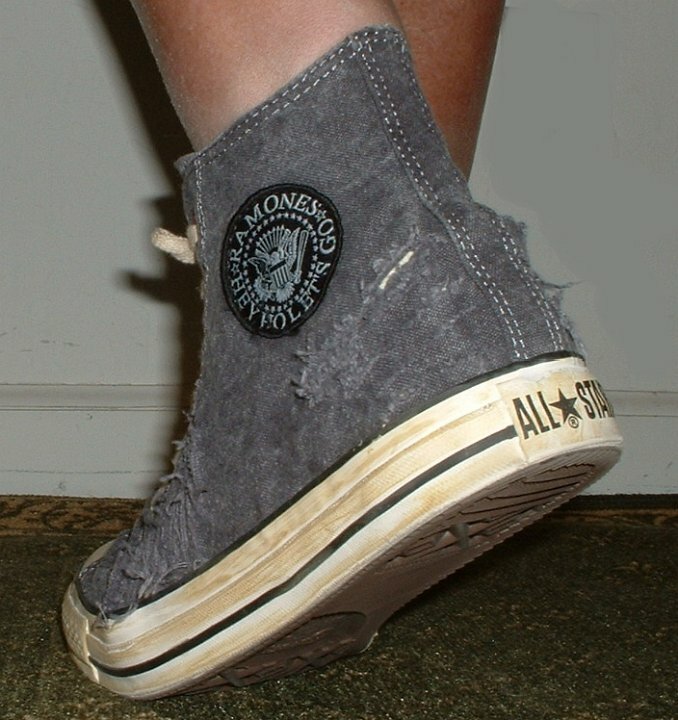 24 Rock and Roll High Top Chucks Inside patch views of black punk print high tops. 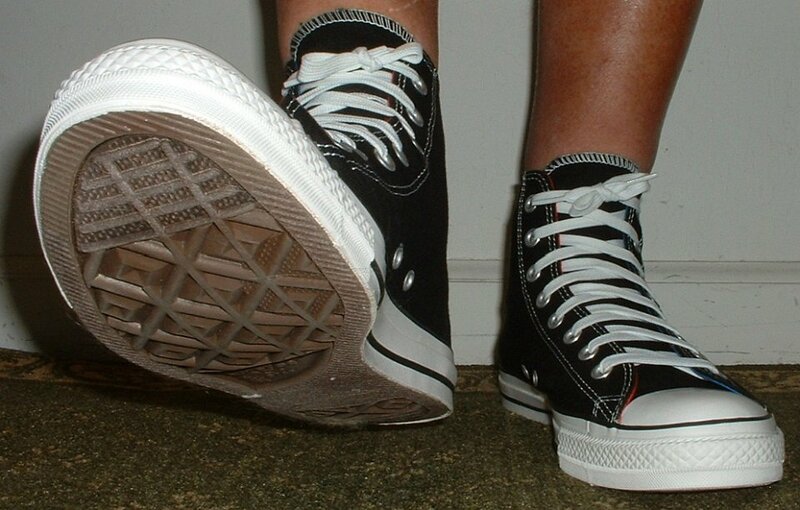 25 Rock and Roll High Top Chucks Outside views of black punk print high tops. 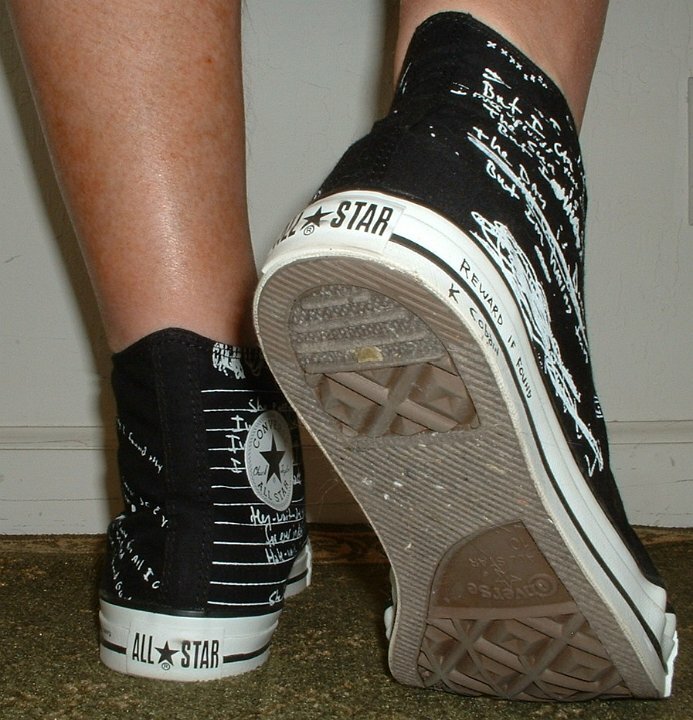 26 Rock and Roll High Top Chucks Inside patch and sole views of black punk print high tops. 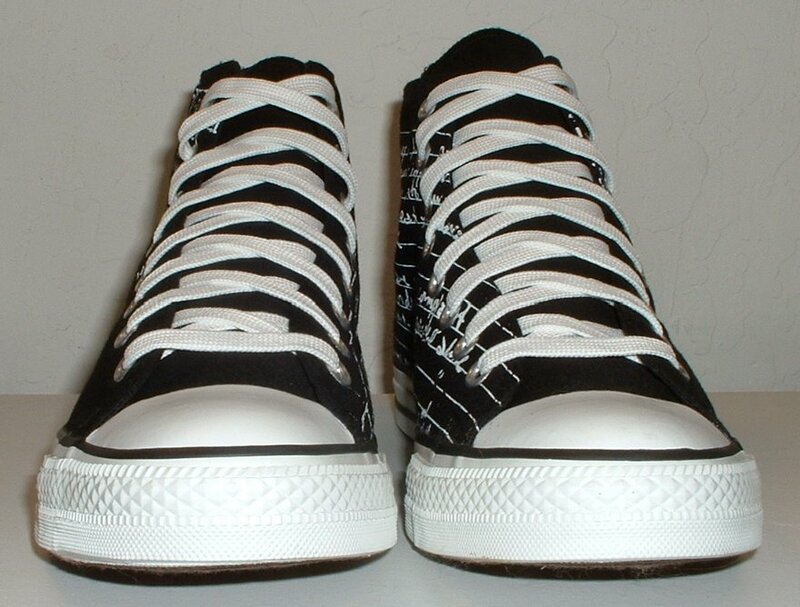 27 Rock and Roll High Top Chucks Wearing black punk print high tops, front view 1. 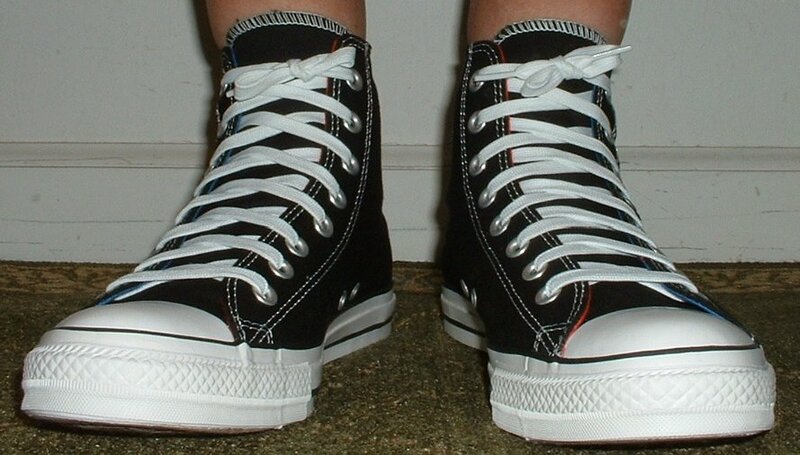 28 Rock and Roll High Top Chucks Wearing black punk print high tops, front view 2. 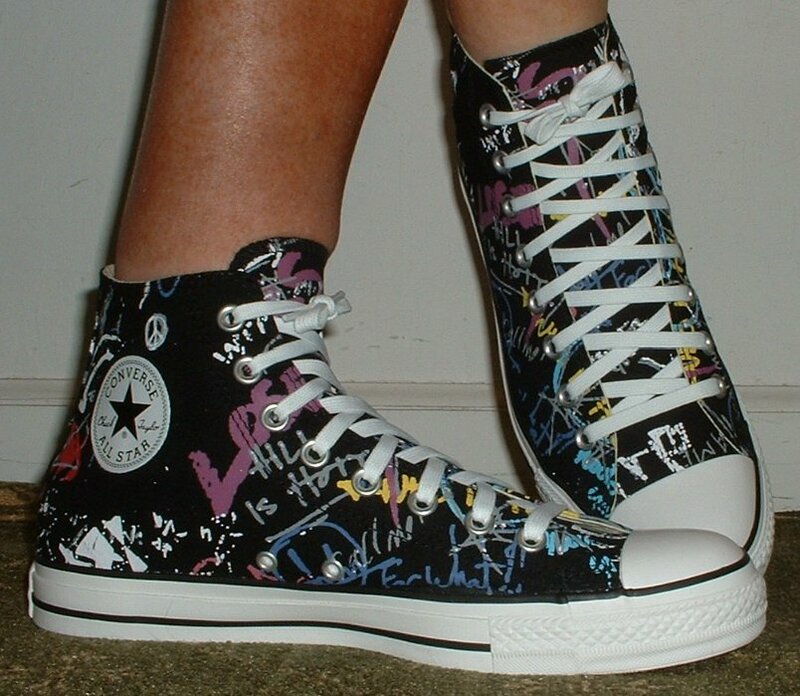 29 Rock and Roll High Top Chucks Wearing black punk print high tops, front view 3. 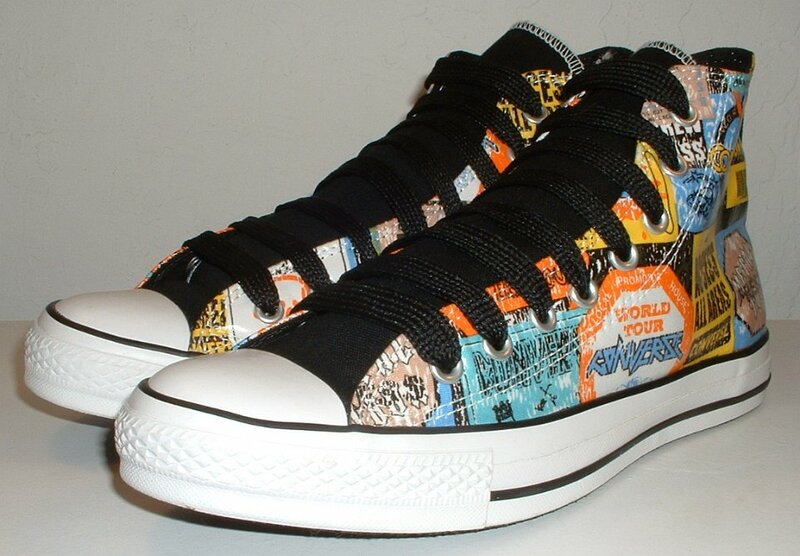 30 Rock and Roll High Top Chucks Wearing black punk print high tops, left side view 1. 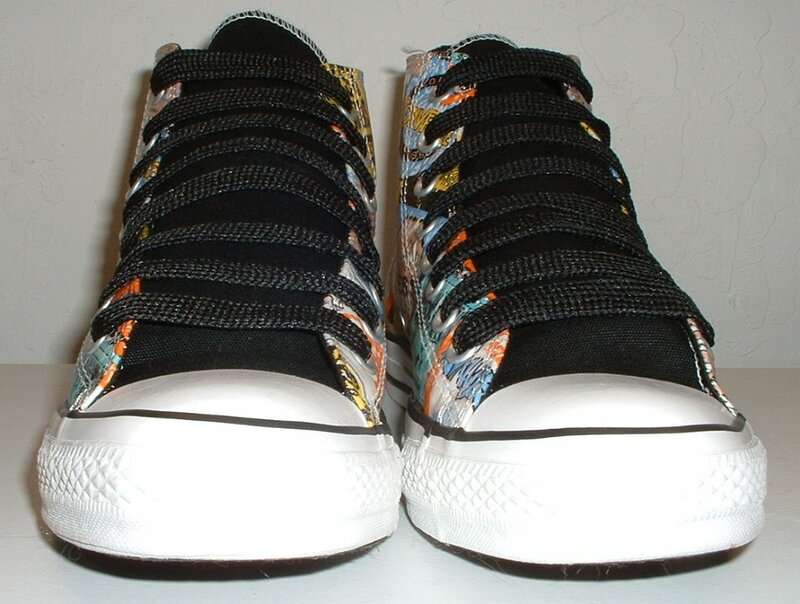 31 Rock and Roll High Top Chucks Wearing black punk print high tops, left side view 2. 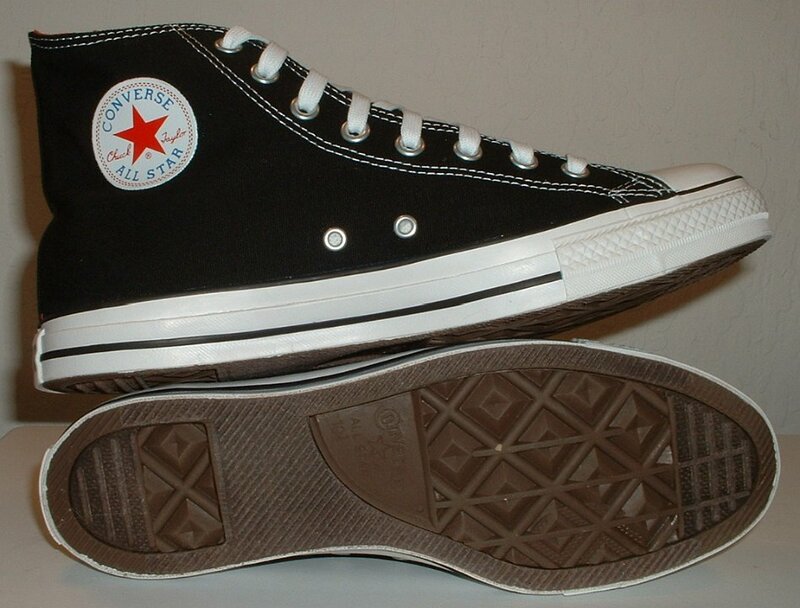 32 Rock and Roll High Top Chucks Wearing black punk print high tops, rear view 1. 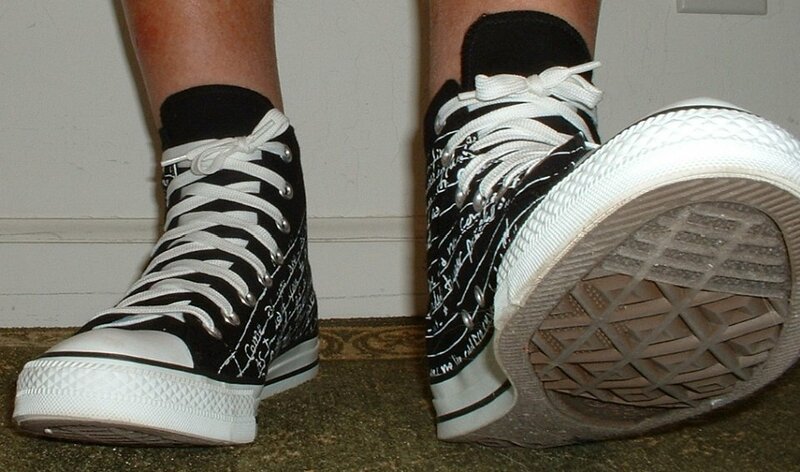 33 Rock and Roll High Top Chucks Wearing black punk print high tops, rear view 2. 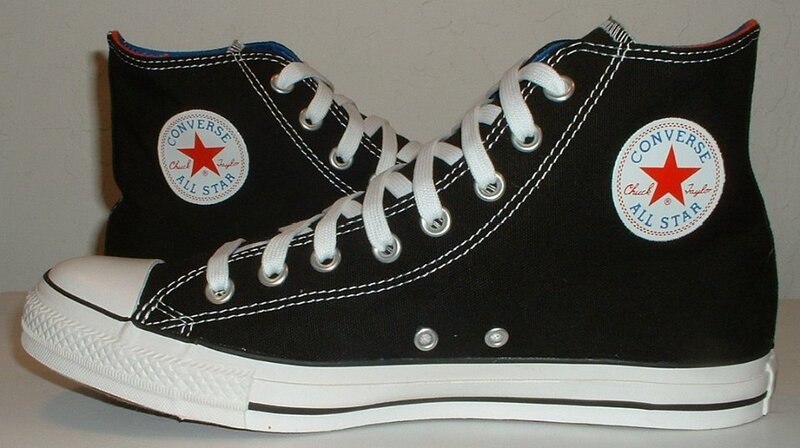 34 Rock and Roll High Top Chucks Wearing black punk print high tops, rear view 3. 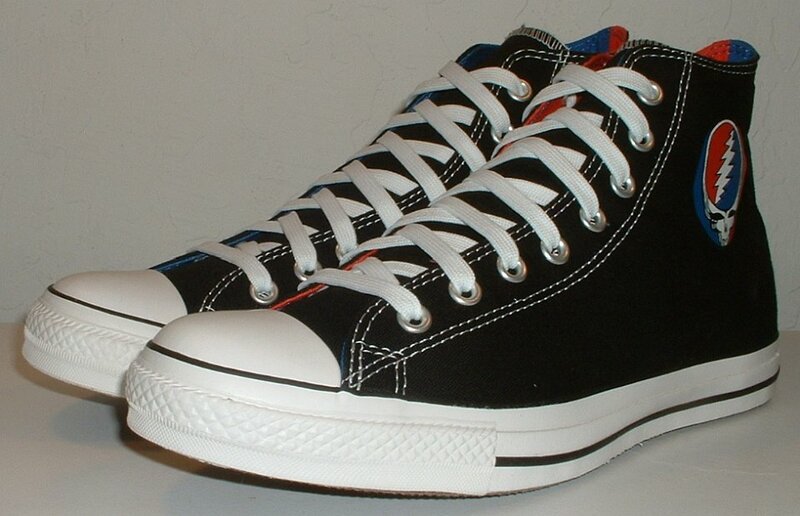 35 Rock and Roll High Top Chucks Wearing black punk print high tops, left side view 1. 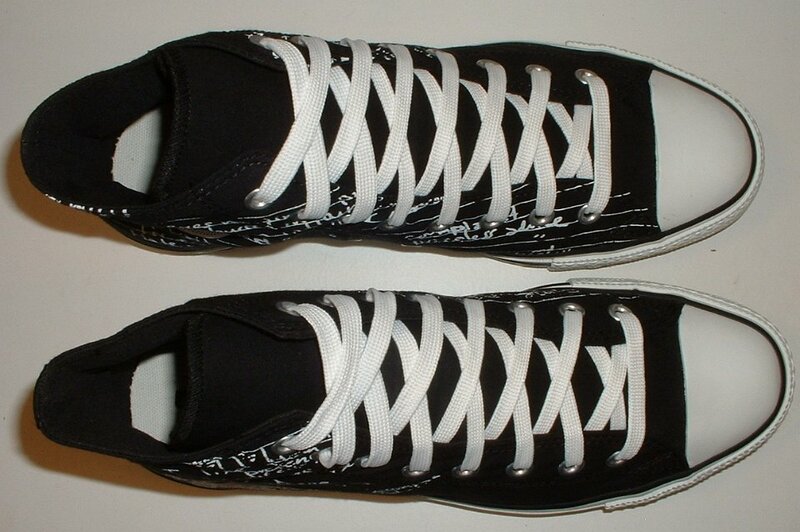 36 Rock and Roll High Top Chucks Wearing black punk print high tops, left side view 2. 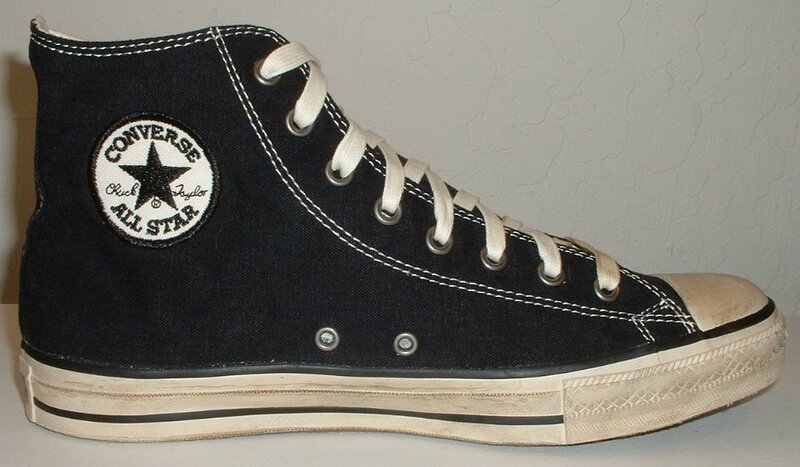 37 Rock and Roll High Top Chucks Inside patch view of a right black Grateful Dead high top. 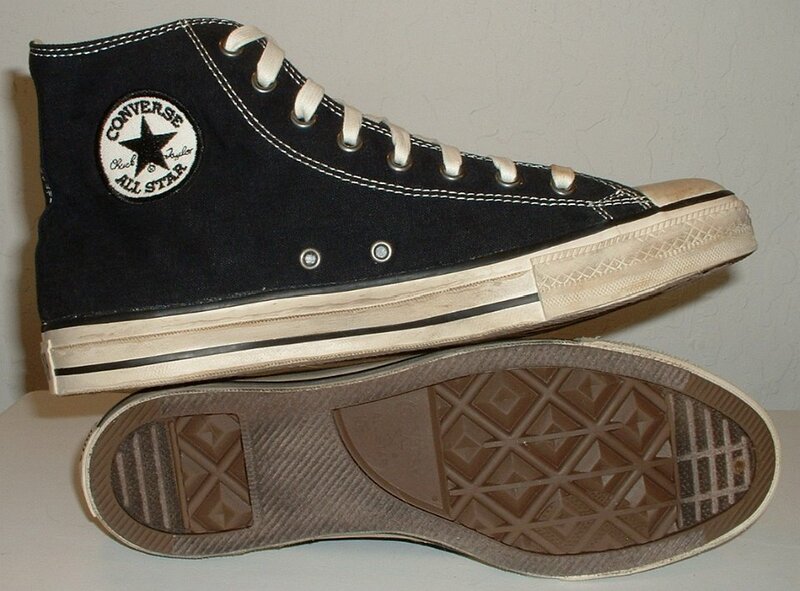 38 Rock and Roll High Top Chucks Outside view of a right black Grateful Dead high top. 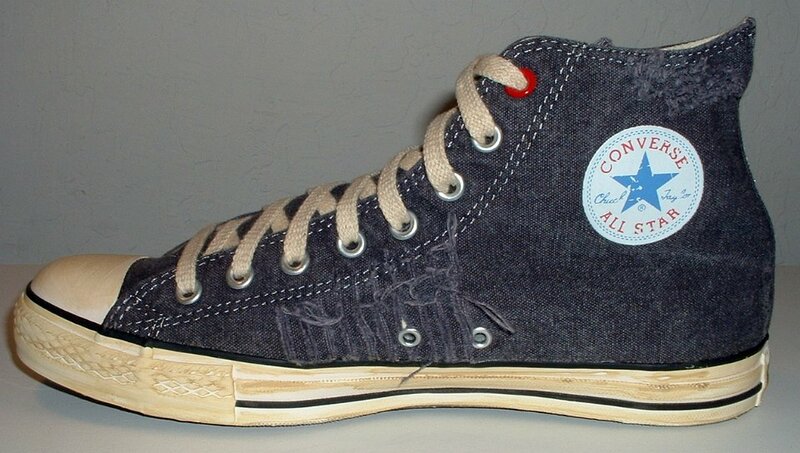 39 Rock and Roll High Top Chucks Inside patch view of a left black Grateful Dead high top. 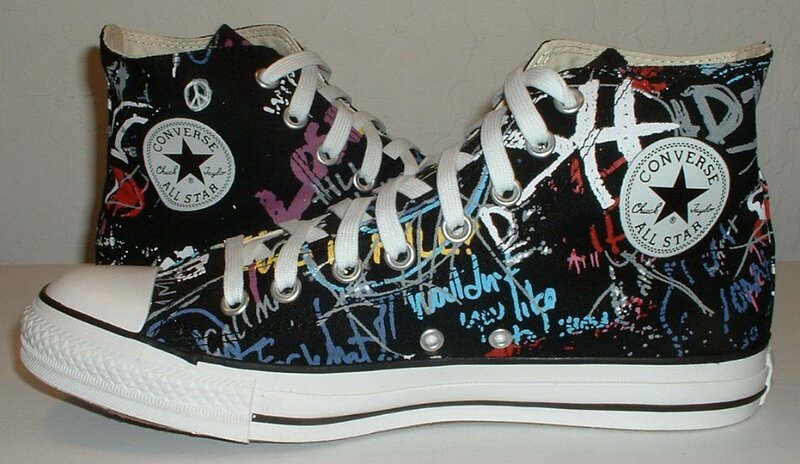 40 Rock and Roll High Top Chucks Outside view of a left black Grateful Dead high top. 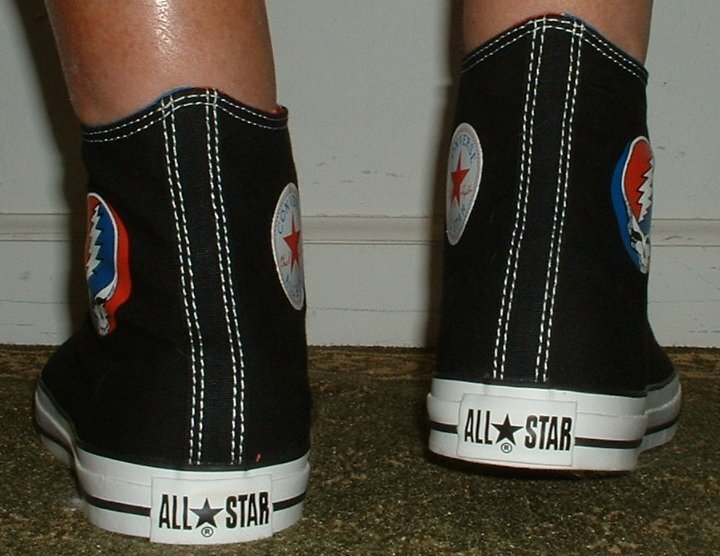 41 Rock and Roll High Top Chucks Rear view of black Grateful Dead high tops. 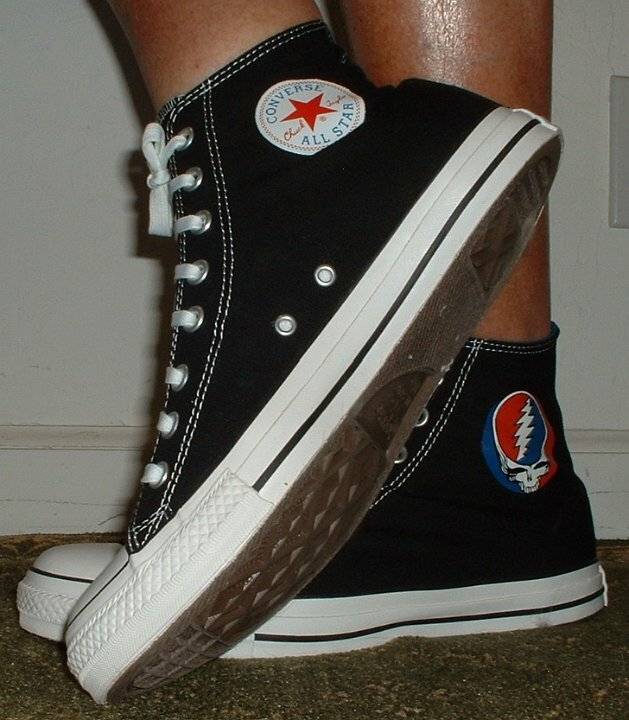 42 Rock and Roll High Top Chucks Angled rear view of black Grateful Dead high tops. 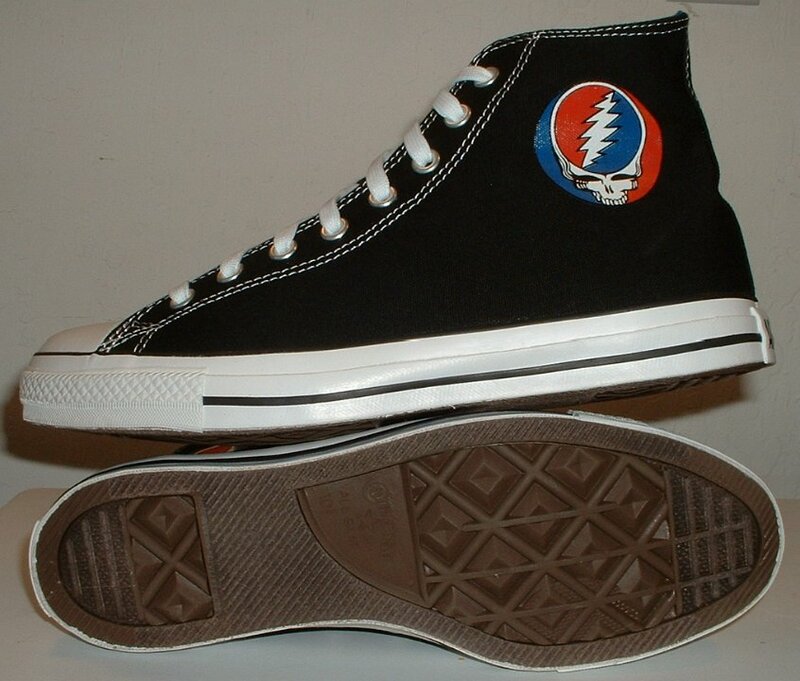 43 Rock and Roll High Top Chucks Angled side view of black Grateful Dead high tops. 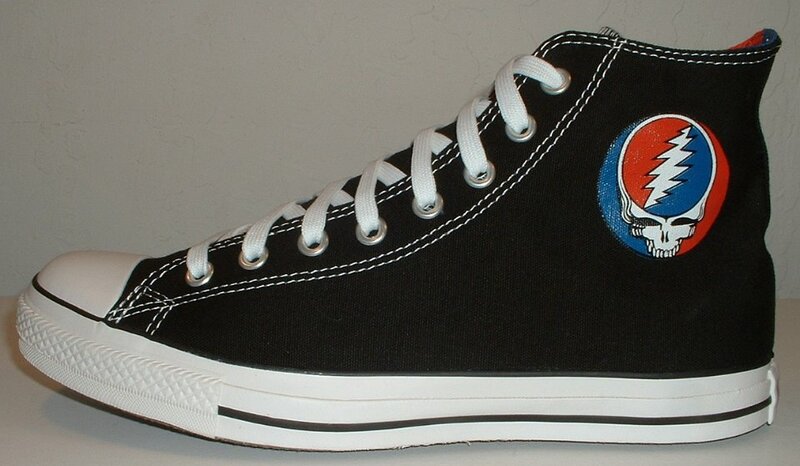 44 Rock and Roll High Top Chucks Front view of black Grateful Dead high tops. 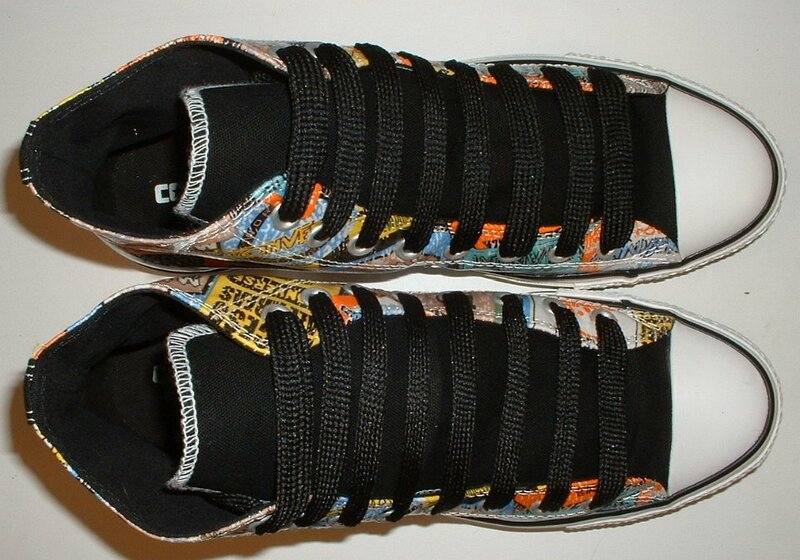 45 Rock and Roll High Top Chucks Angled front view of black Grateful Dead high tops. 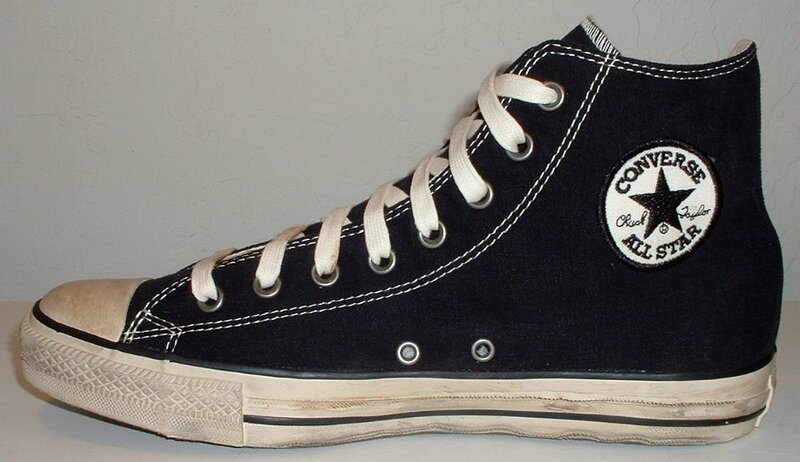 46 Rock and Roll High Top Chucks Top view of black Grateful Dead high tops. 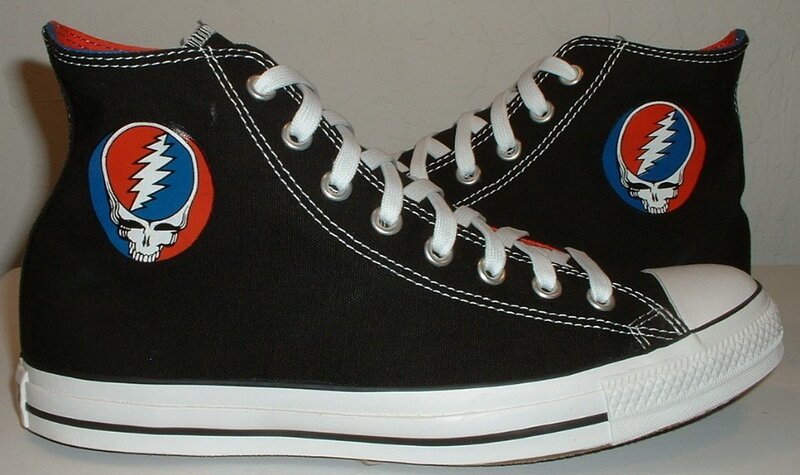 47 Rock and Roll High Top Chucks Inside patch views of black Grateful Dead high tops. 48 Rock and Roll High Top Chucks Outside views of black Grateful Dead high tops. 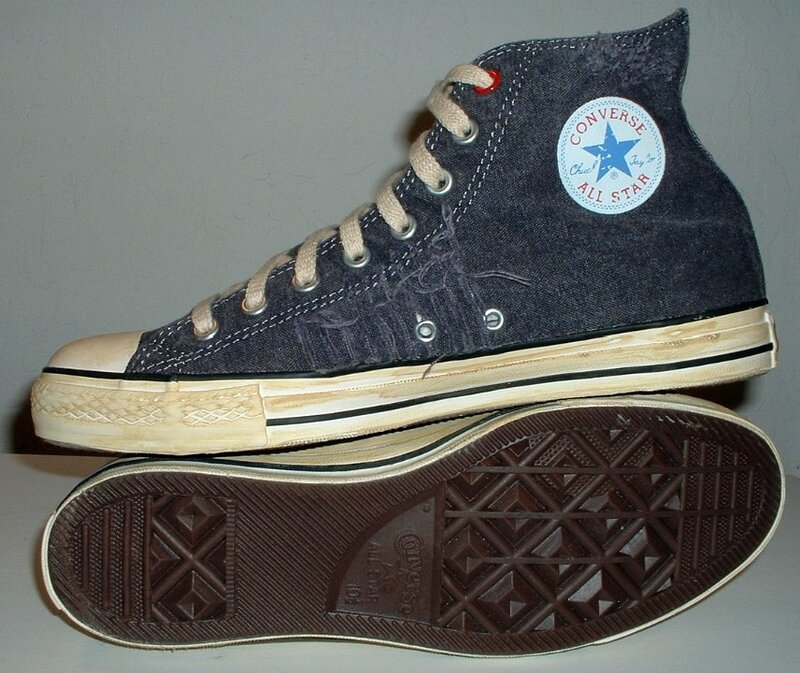 49 Rock and Roll High Top Chucks Inside patch and sole views of black Grateful Dead high tops. 50 Rock and Roll High Top Chucks Outside and sole views of black Grateful Dead high tops. 51 Rock and Roll High Top Chucks Closeup of the inner sole of a black Grateful Dead high top. 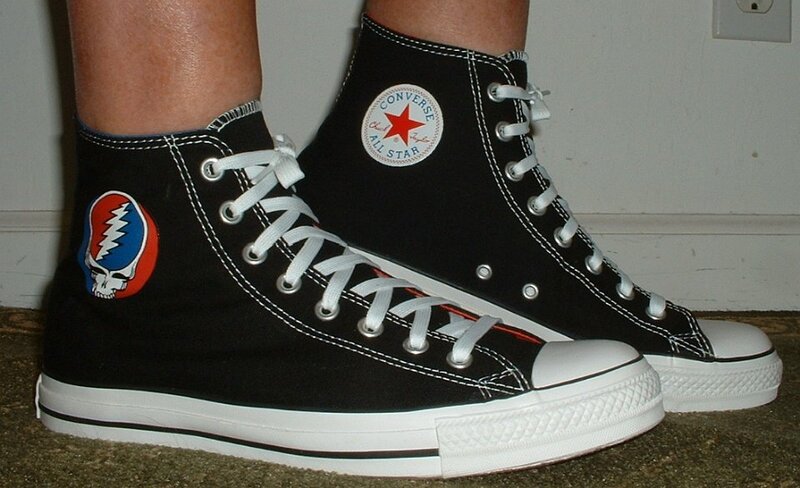 52 Rock and Roll High Top Chucks Wearing black Grateful Dead high tops, front view 1. 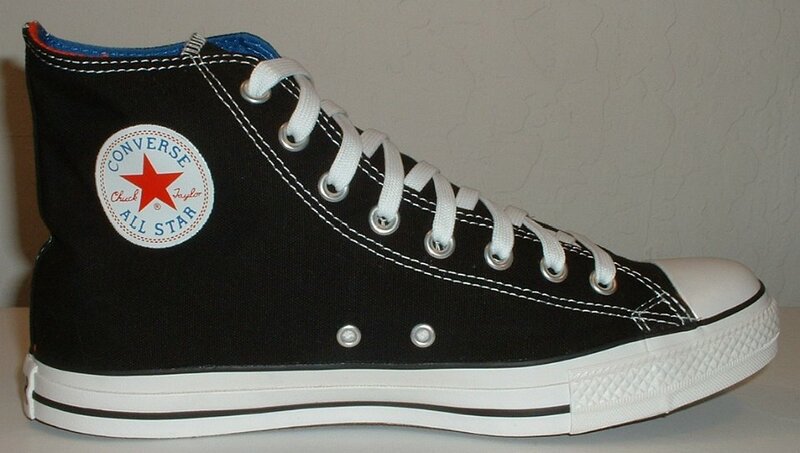 53 Rock and Roll High Top Chucks Wearing black Grateful Dead high tops, front view 2. 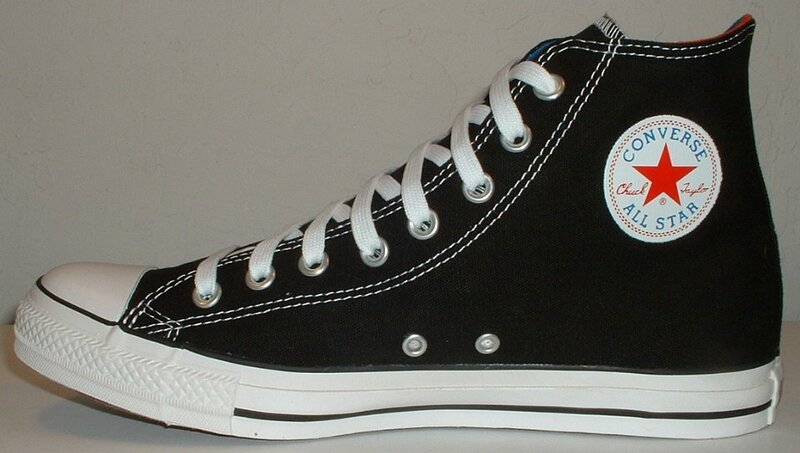 54 Rock and Roll High Top Chucks Wearing black Grateful Dead high tops, front view 3. 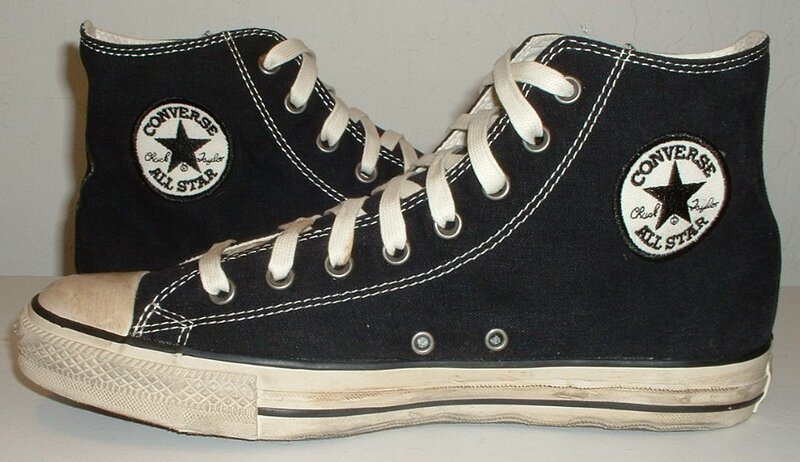 55 Rock and Roll High Top Chucks Wearing black Grateful Dead high tops, front view 4. 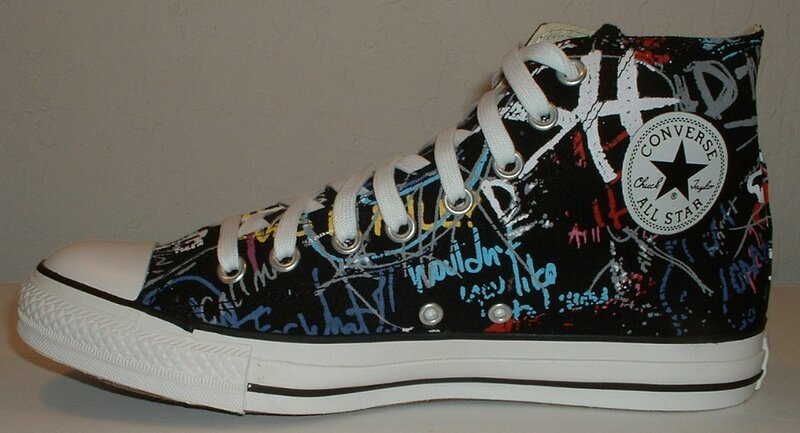 56 Rock and Roll High Top Chucks Wearing black Grateful Dead high tops, right view 1. 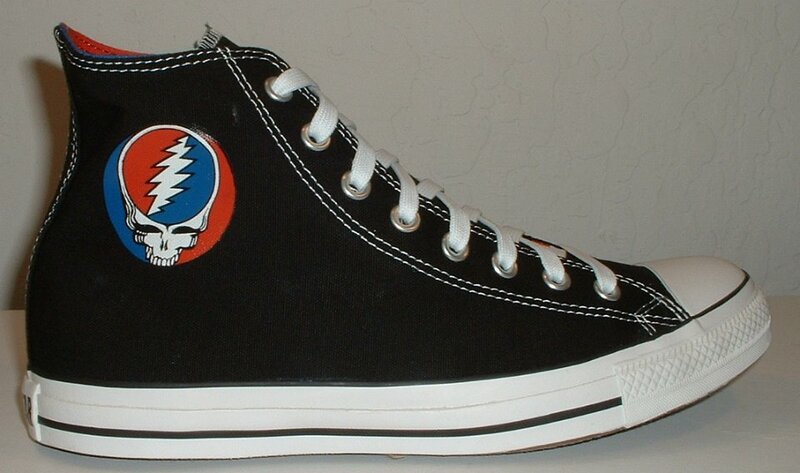 57 Rock and Roll High Top Chucks Wearing black Grateful Dead high tops, right view 2. 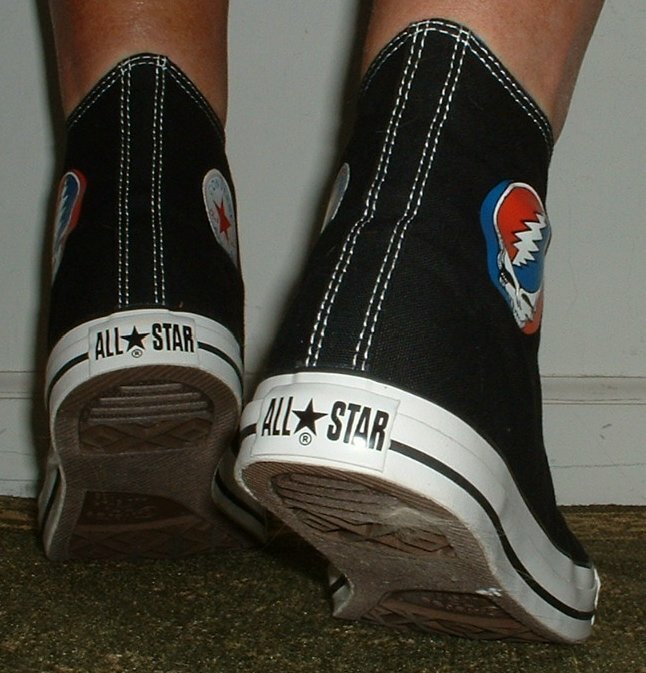 58 Rock and Roll High Top Chucks Wearing black Grateful Dead high tops, rear view 1. 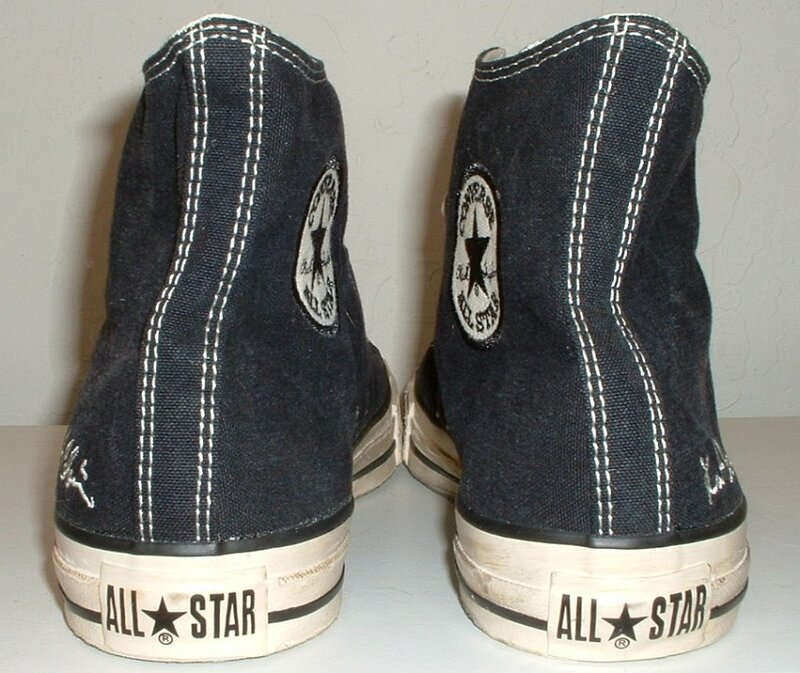 59 Rock and Roll High Top Chucks Wearing black Grateful Dead high tops, rear view 2. 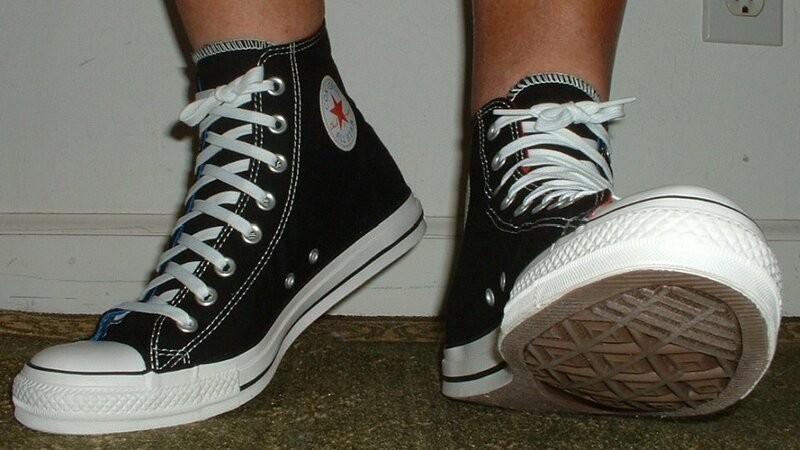 60 Rock and Roll High Top Chucks Wearing black Grateful Dead high tops, rear view 3. 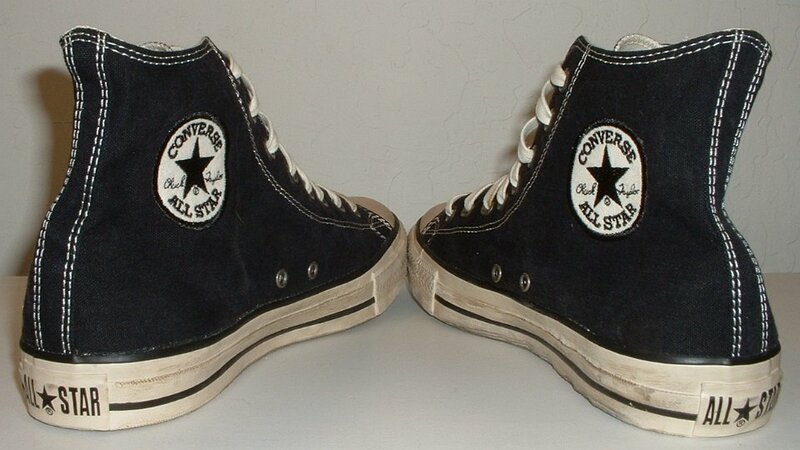 61 Rock and Roll High Top Chucks Wearing black Grateful Dead high tops, left side view 1. 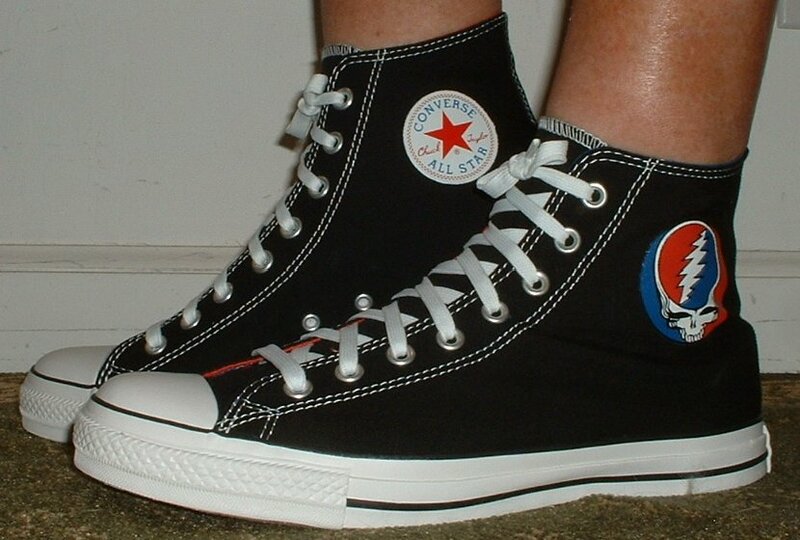 62 Rock and Roll High Top Chucks Wearing black Grateful Dead high tops, left side view 2. 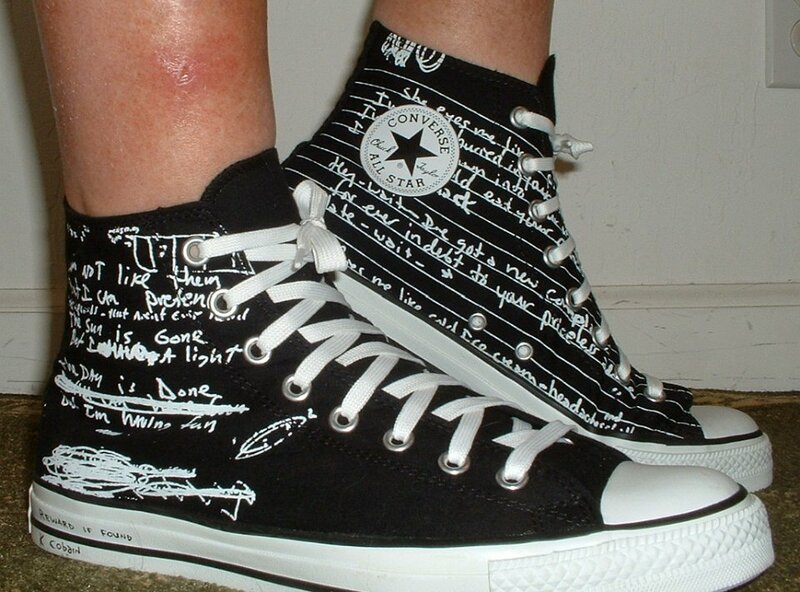 63 Rock and Roll High Top Chucks Right Kurt Cobain Lyrics high top, inside patch view. 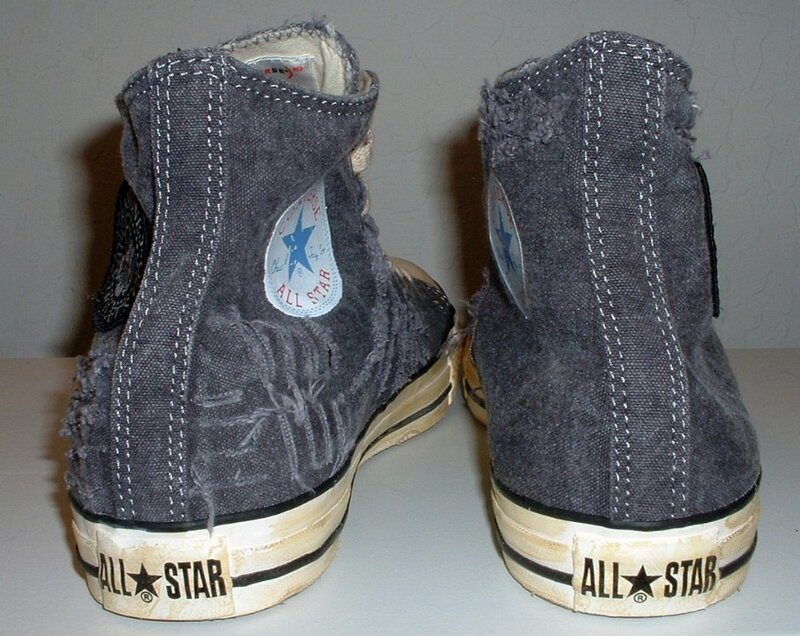 64 Rock and Roll High Top Chucks Right Kurt Cobain Lyrics high top, outside view. 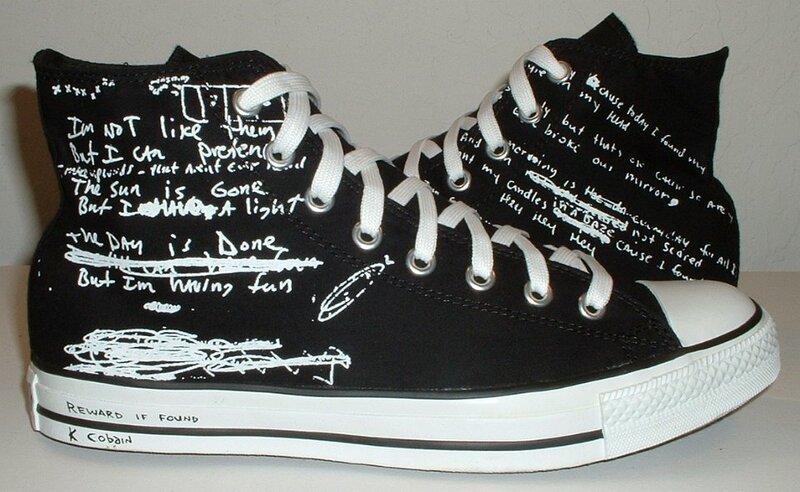 65 Rock and Roll High Top Chucks Left Kurt Cobain Lyrics high top, outside view. 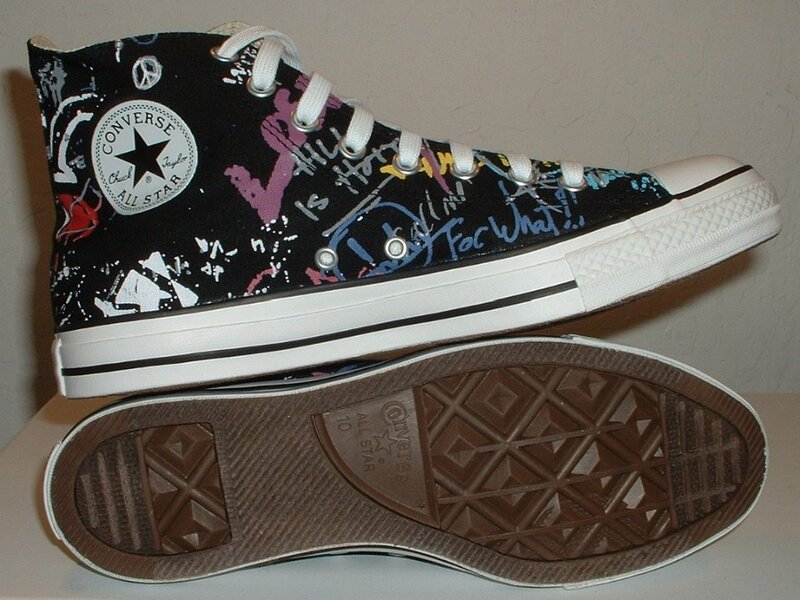 66 Rock and Roll High Top Chucks Left Kurt Cobain Lyrics high top, inside patch view. 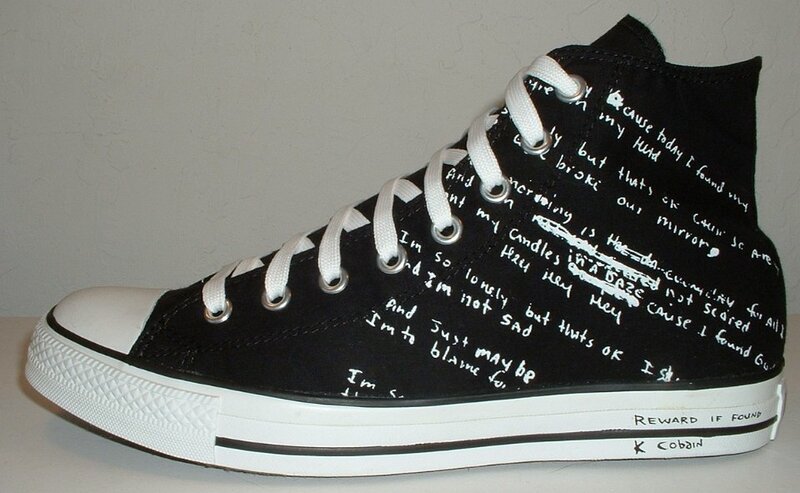 67 Rock and Roll High Top Chucks Kurt Cobain Lyrics high tops, rear view. 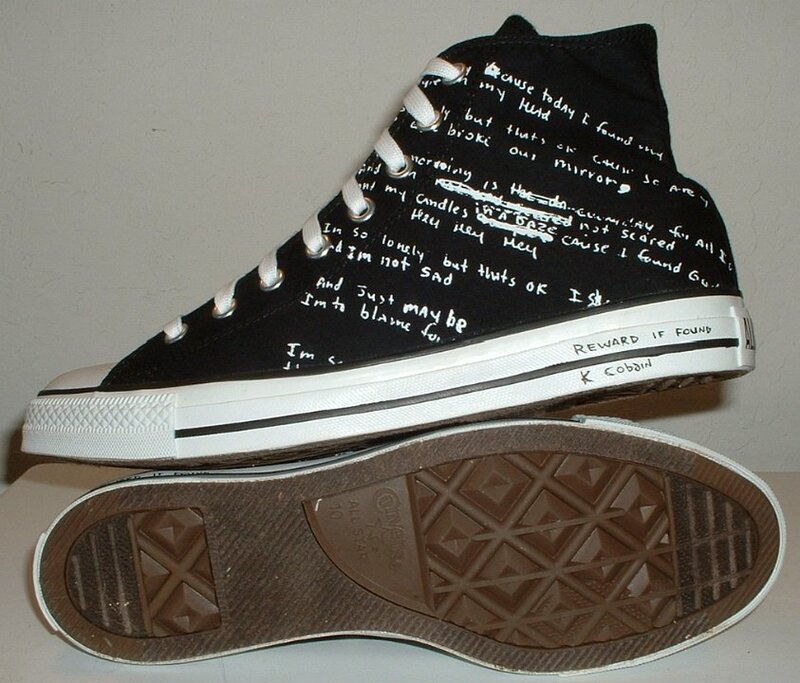 68 Rock and Roll High Top Chucks Kurt Cobain Lyrics high tops, angled rear view. 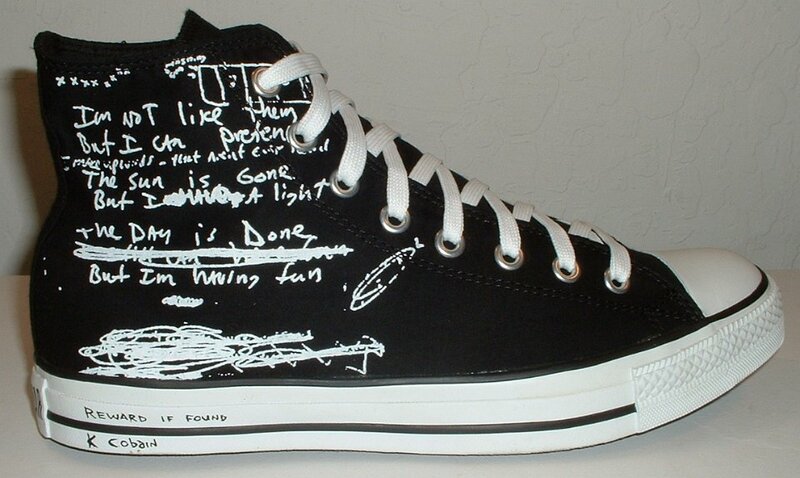 69 Rock and Roll High Top Chucks Kurt Cobain Lyrics high tops, angled side view. 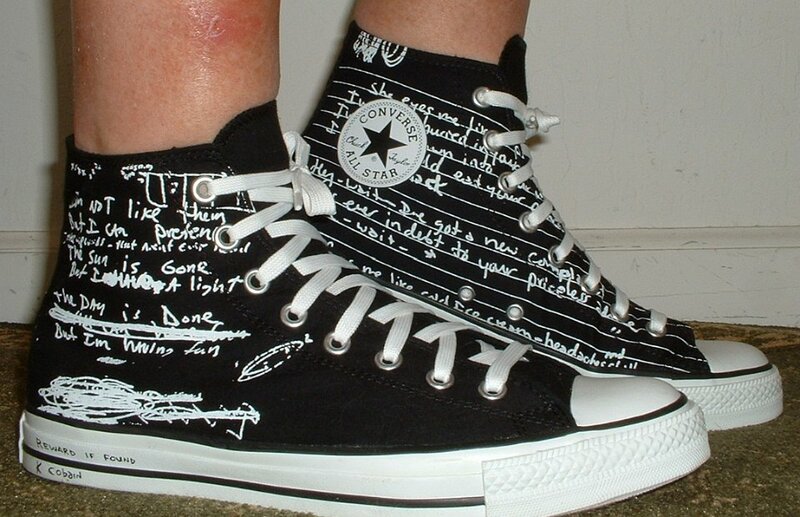 70 Rock and Roll High Top Chucks Kurt Cobain Lyrics high tops, front view. 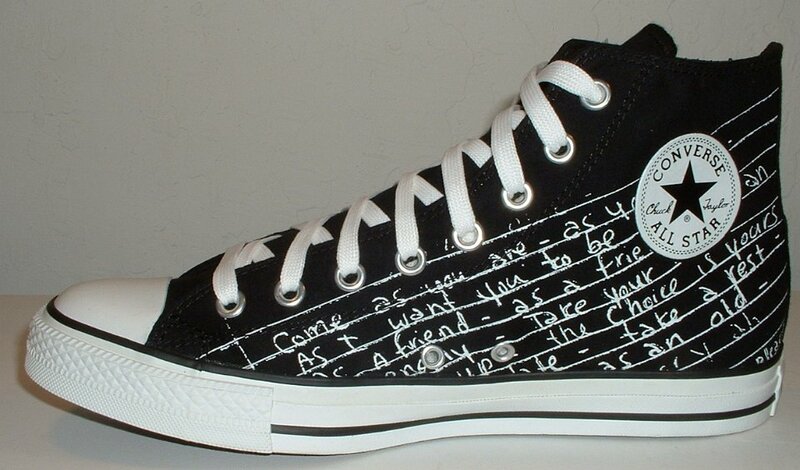 71 Rock and Roll High Top Chucks Kurt Cobain Lyrics high tops, angled front view. 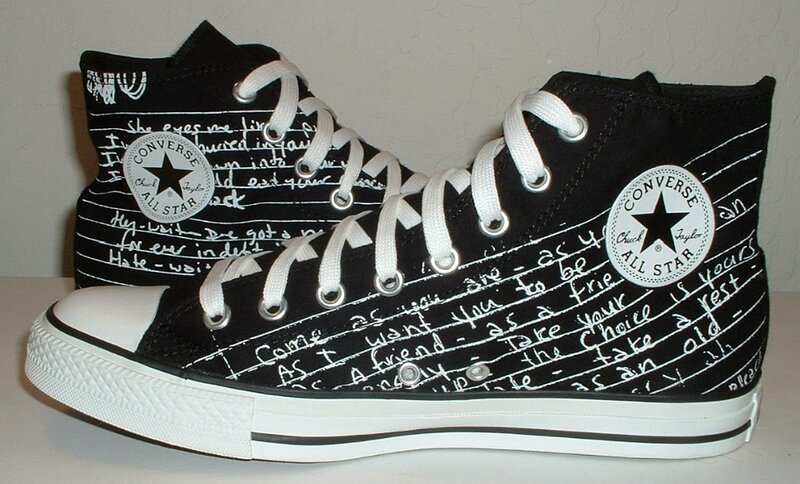 72 Rock and Roll High Top Chucks Kurt Cobain Lyrics high tops, top view. 73 Rock and Roll High Top Chucks Kurt Cobain Lyrics high tops, insdie patch views. 74 Rock and Roll High Top Chucks Kurt Cobain Lyrics high tops, outside views. 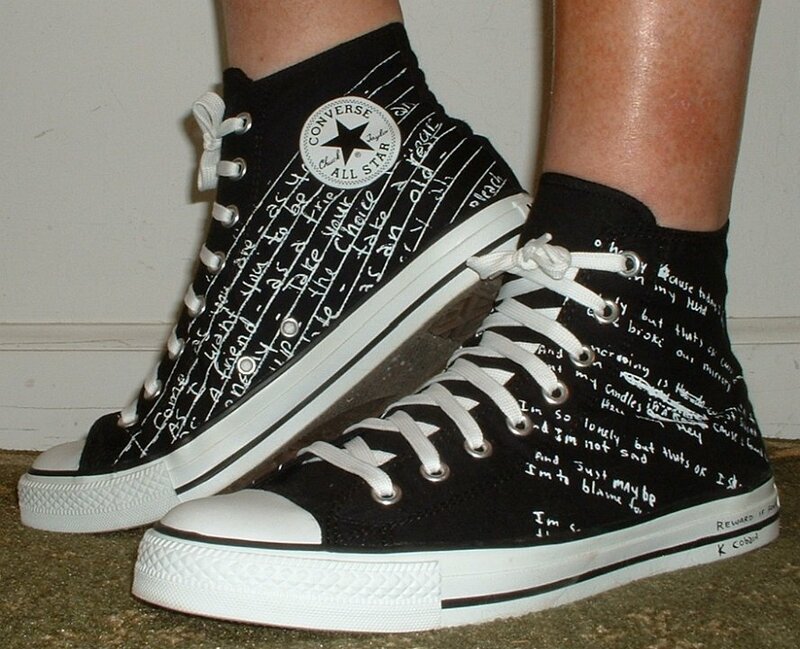 75 Rock and Roll High Top Chucks Kurt Cobain Lyrics high tops, outside and sole views. 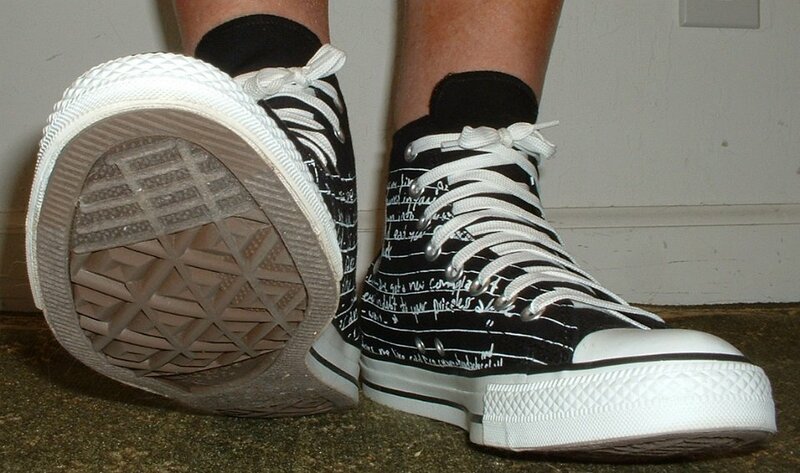 76 Rock and Roll High Top Chucks Kurt Cobain Lyrics high tops, inner sole closeup. 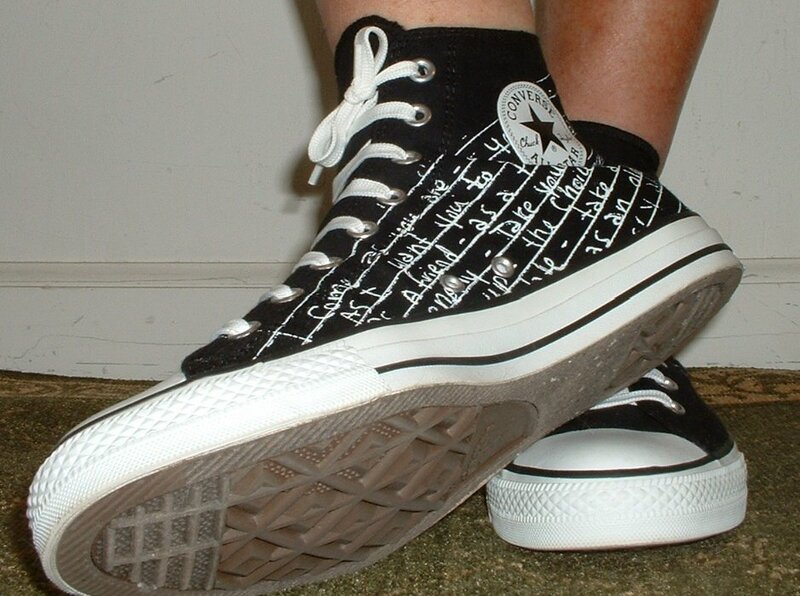 77 Rock and Roll High Top Chucks Wearing Kurt Cobain lyrics high, front view, shot 1. 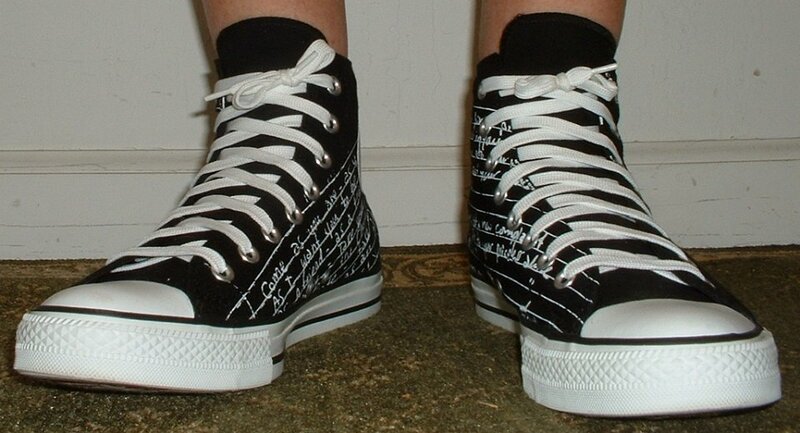 78 Rock and Roll High Top Chucks Wearing Kurt Cobain lyrics high, front view, shot 2. 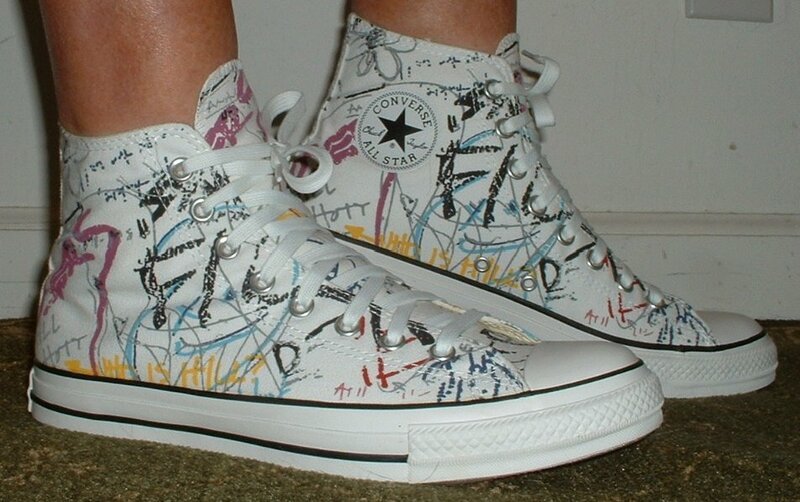 79 Rock and Roll High Top Chucks Wearing Kurt Cobain Lyrics high, front view, shot 3. 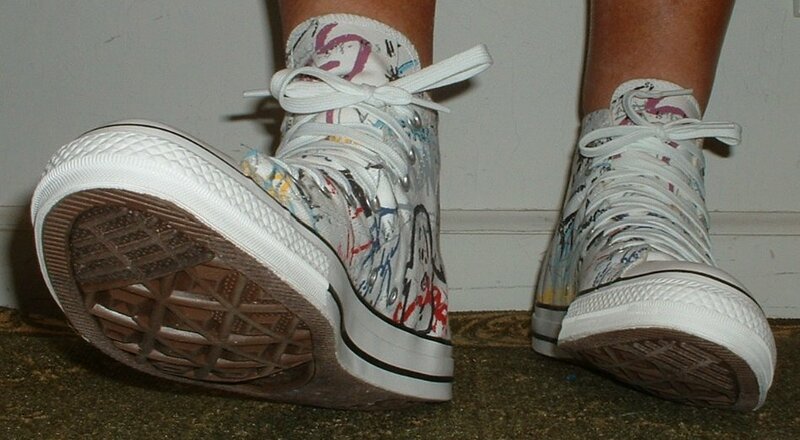 80 Rock and Roll High Top Chucks Wearing Kurt Cobain lyrics high, front view, shot 4. 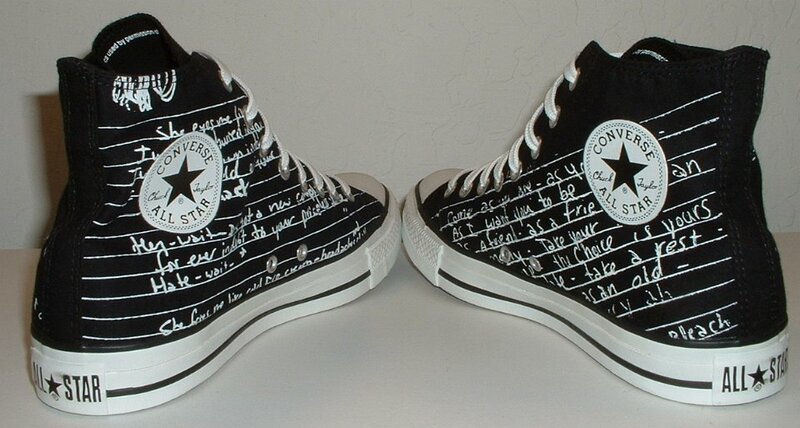 81 Rock and Roll High Top Chucks Wearing Kurt Cobain lyrics high, left side view, shot 1. 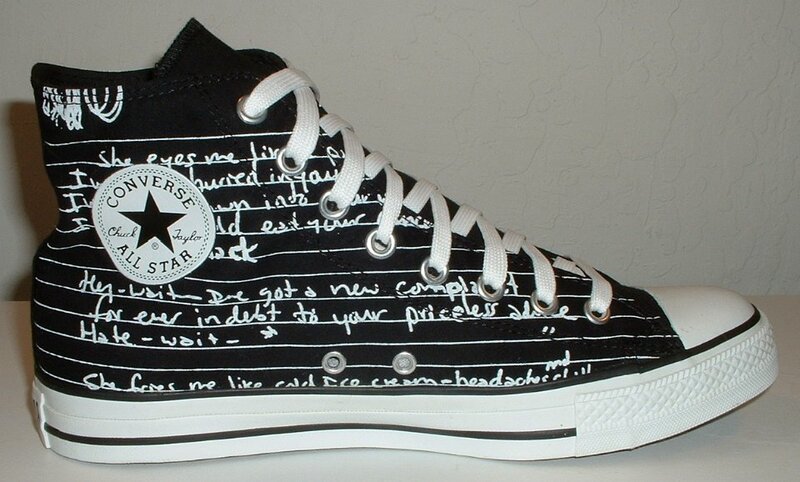 82 Rock and Roll High Top Chucks Wearing Kurt Cobain lyrics high, left side view, shot 2. 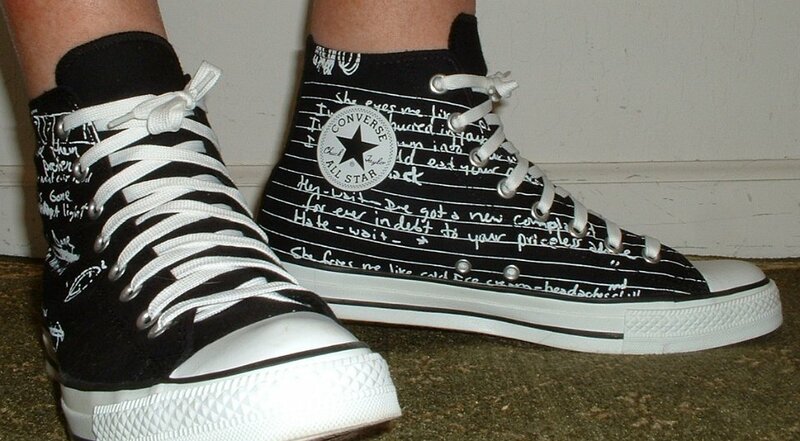 83 Rock and Roll High Top Chucks Wearing Kurt Cobain lyrics high, rear view, shot 1. 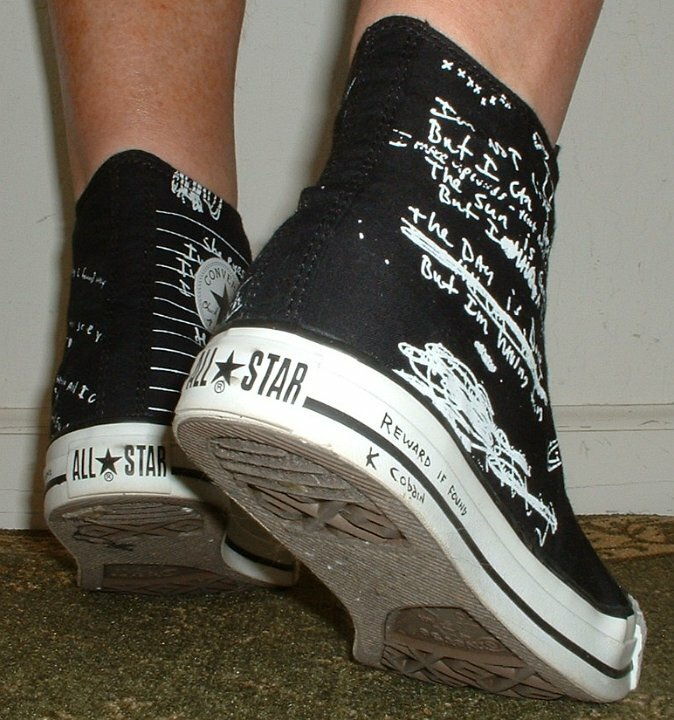 84 Rock and Roll High Top Chucks Wearing Kurt Cobain lyrics high, rear view, shot 2. 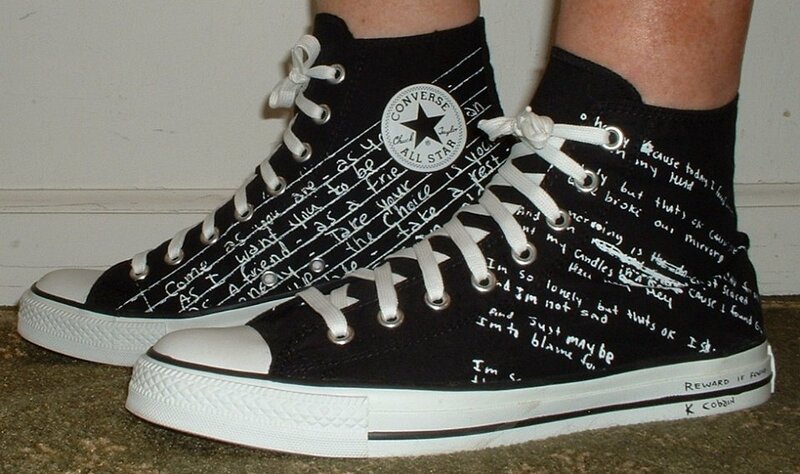 85 Rock and Roll High Top Chucks Wearing Kurt Cobain lyrics high, rear view, shot 3. 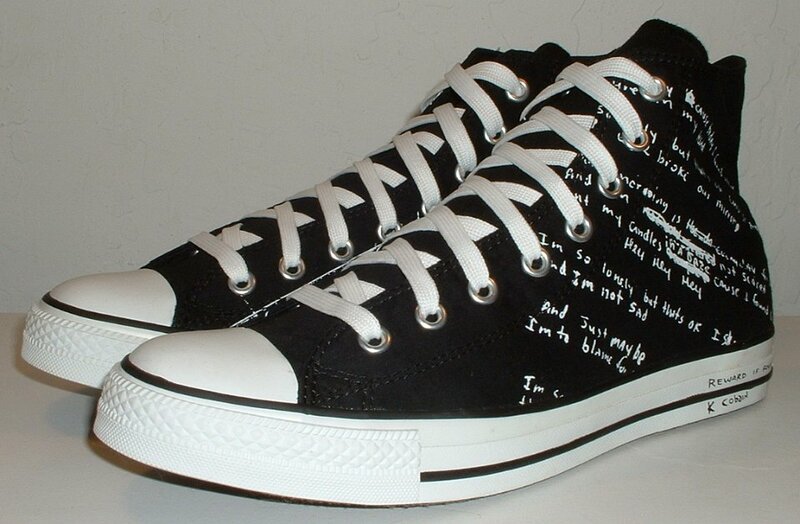 86 Rock and Roll High Top Chucks Wearing Kurt Cobain lyrics high, right side view, shot 1. 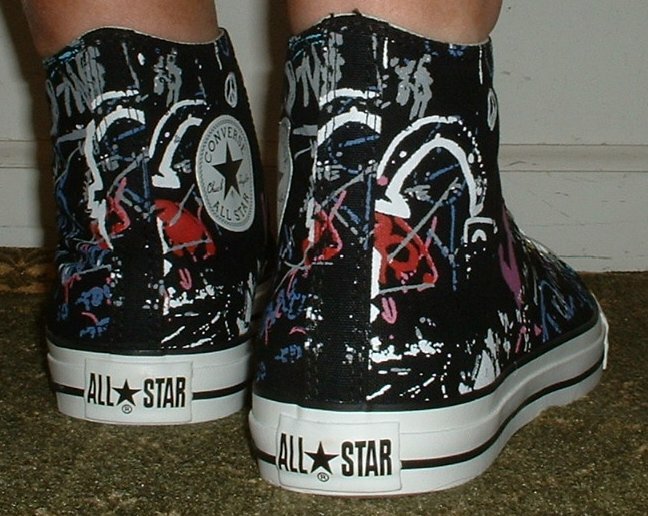 87 Rock and Roll High Top Chucks Wearing Kurt Cobain lyrics high, right side view, shot 2. 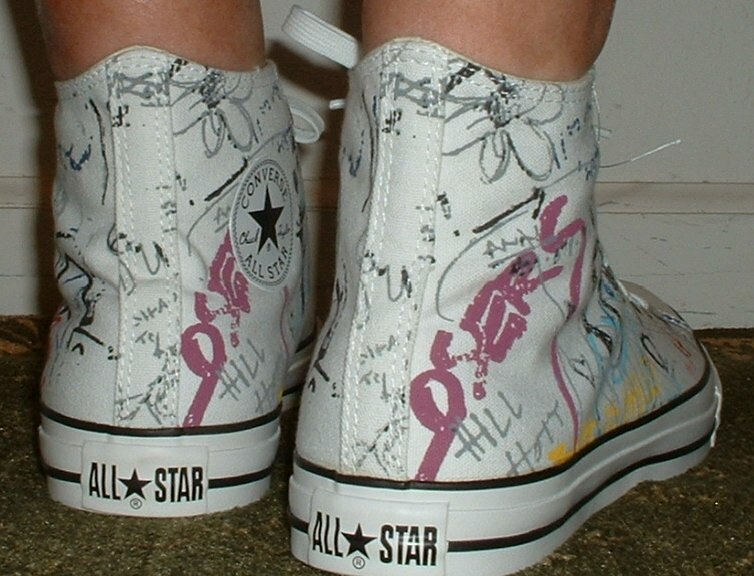 88 Rock and Roll High Top Chucks Wearing Kurt Cobain lyrics high, right side view, shot 3. 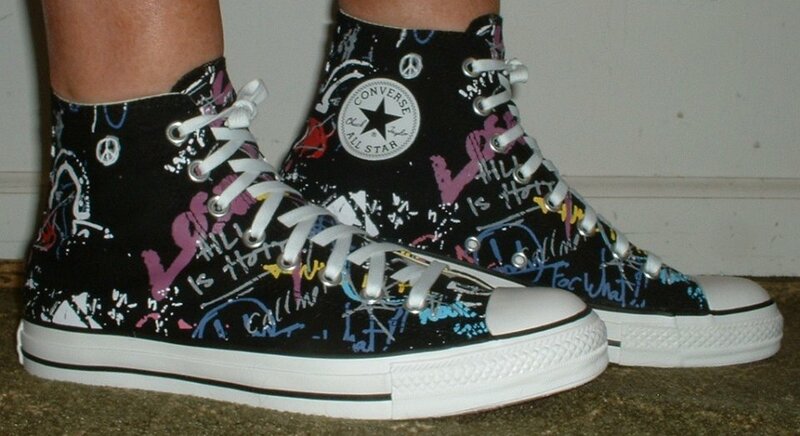 89 Rock and Roll High Top Chucks Wearing Kurt Cobain lyrics high, front view, shot 5. 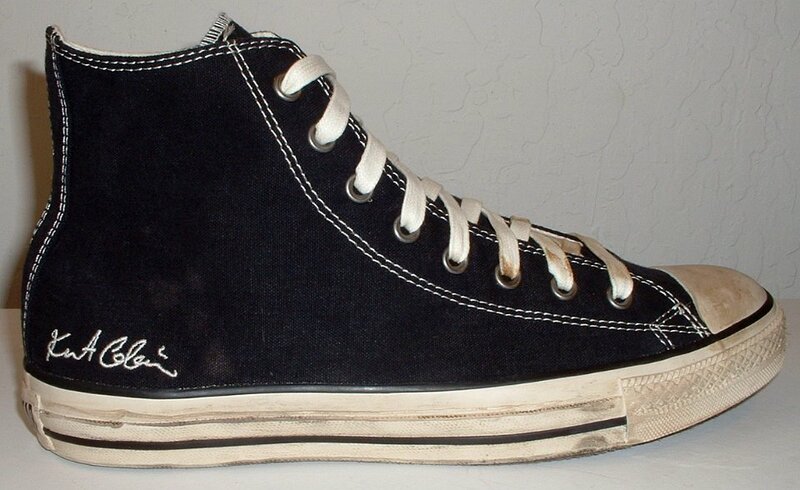 90 Rock and Roll High Top Chucks Right Kurt Cobain signature high top, inside patch view. 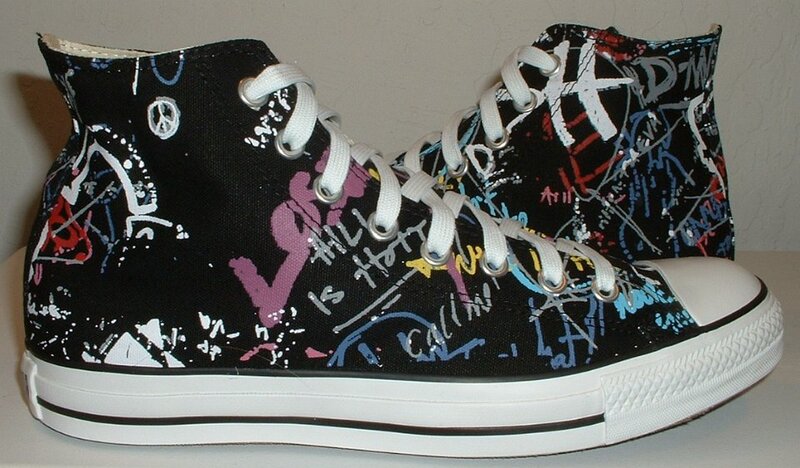 91 Rock and Roll High Top Chucks Right Kurt Cobain signature high top, outside view. 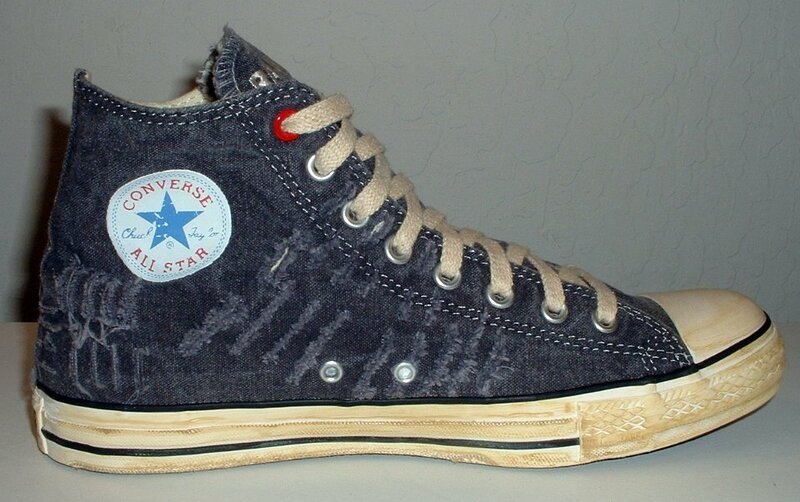 92 Rock and Roll High Top Chucks Left Kurt Cobain signature high top, inside patch view. 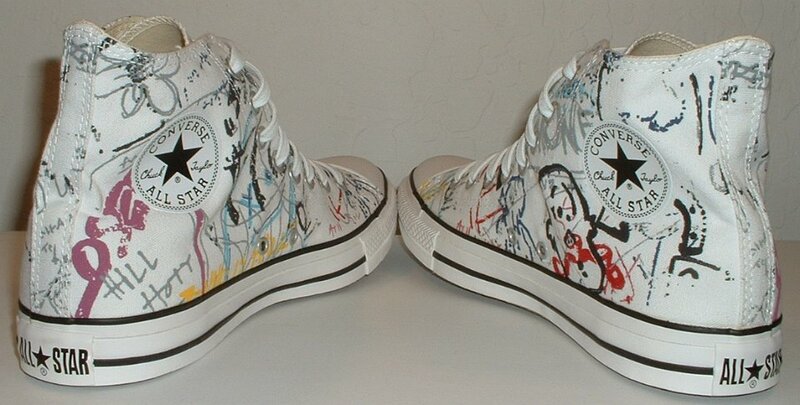 93 Rock and Roll High Top Chucks Left Kurt Cobain signature high top, outside view. 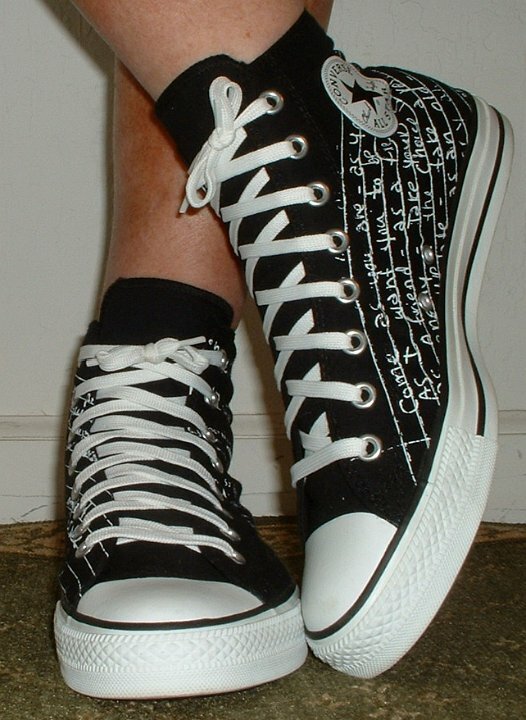 94 Rock and Roll High Top Chucks Kurt Cobain Signature high tops, rear view. 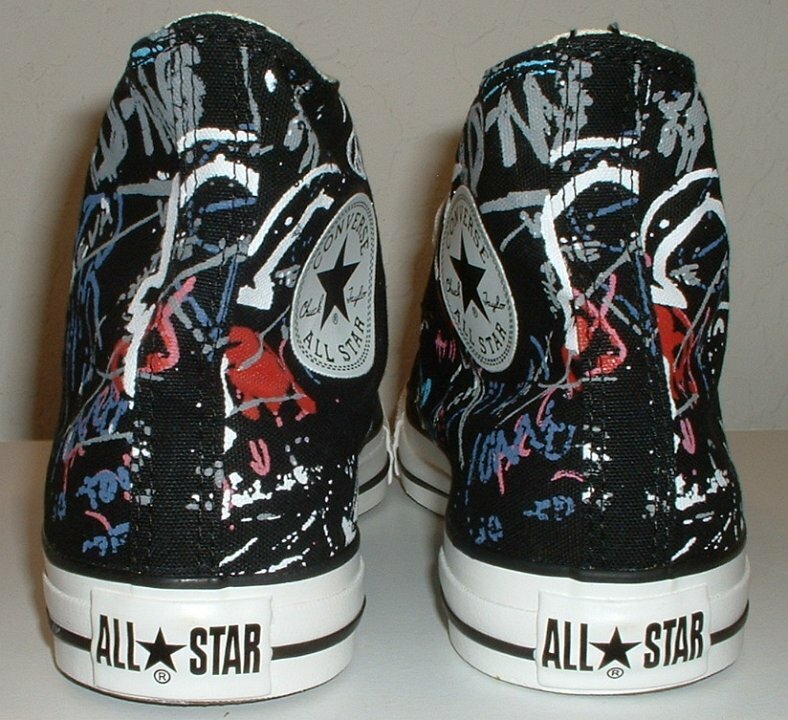 95 Rock and Roll High Top Chucks Kurt Cobain Signature high tops, angled rear view. 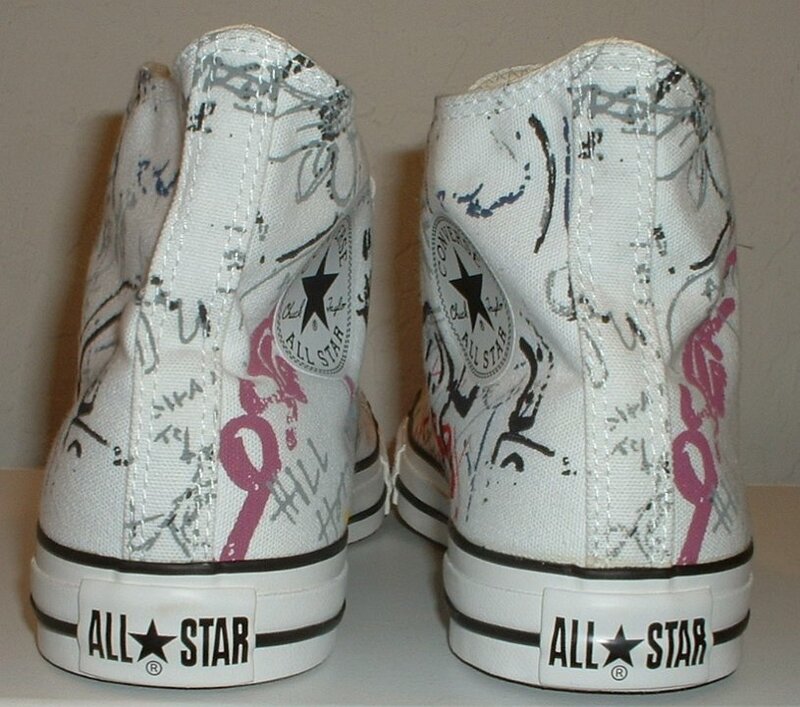 96 Rock and Roll High Top Chucks Kurt Cobain Signature high tops, angled side view. 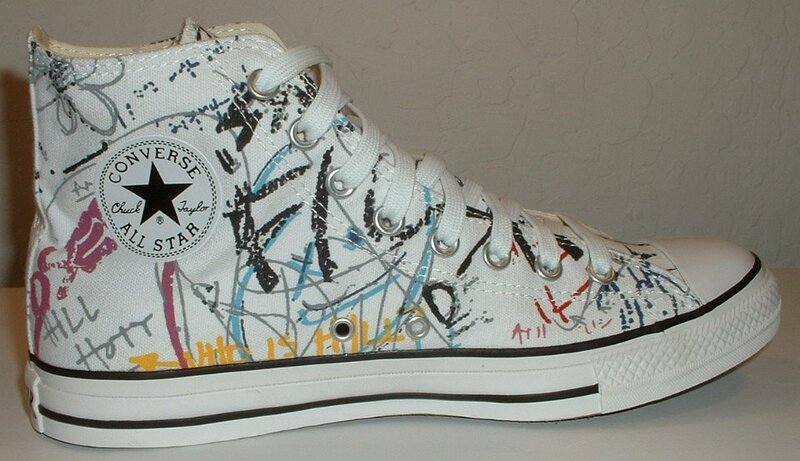 97 Rock and Roll High Top Chucks Kurt Cobain Signature high tops, front view. 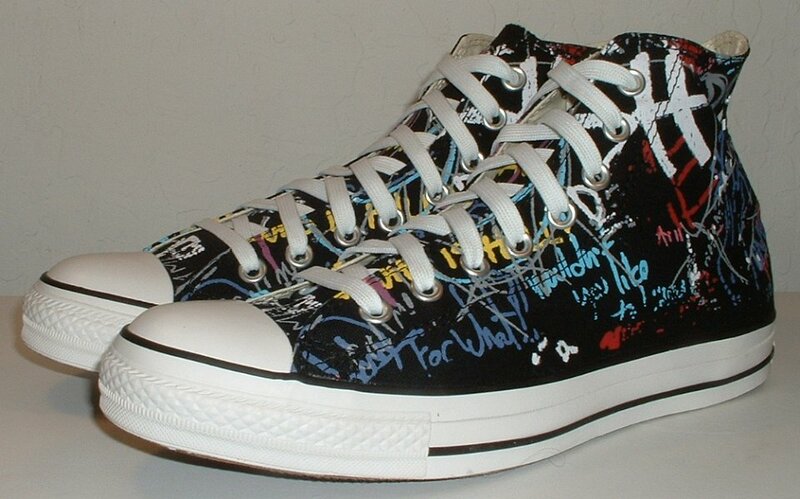 98 Rock and Roll High Top Chucks Kurt Cobain Signature high tops, angled front view. 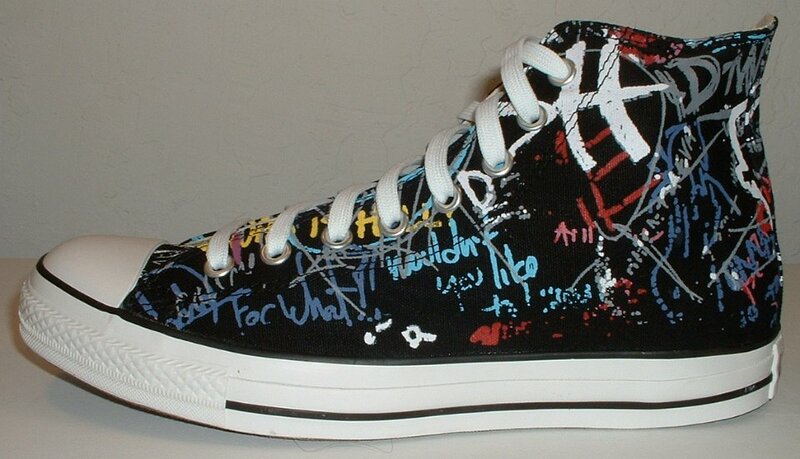 99 Rock and Roll High Top Chucks Kurt Cobain Signature high tops, top view. 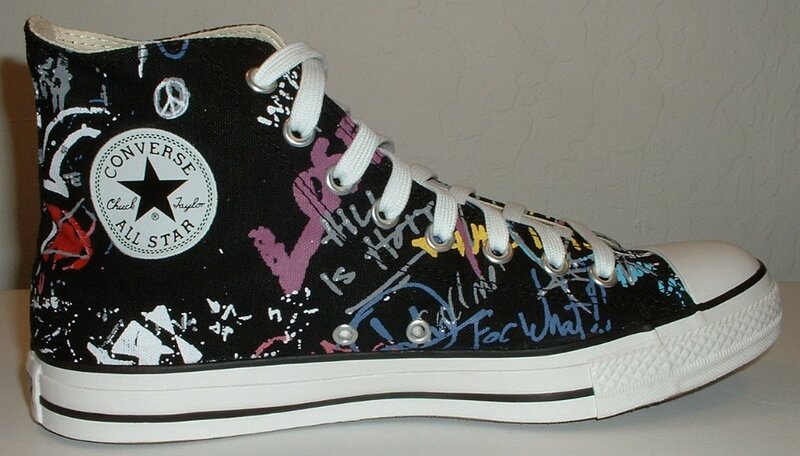 100 Rock and Roll High Top Chucks Kurt Cobain Signature high tops, inside patch views. 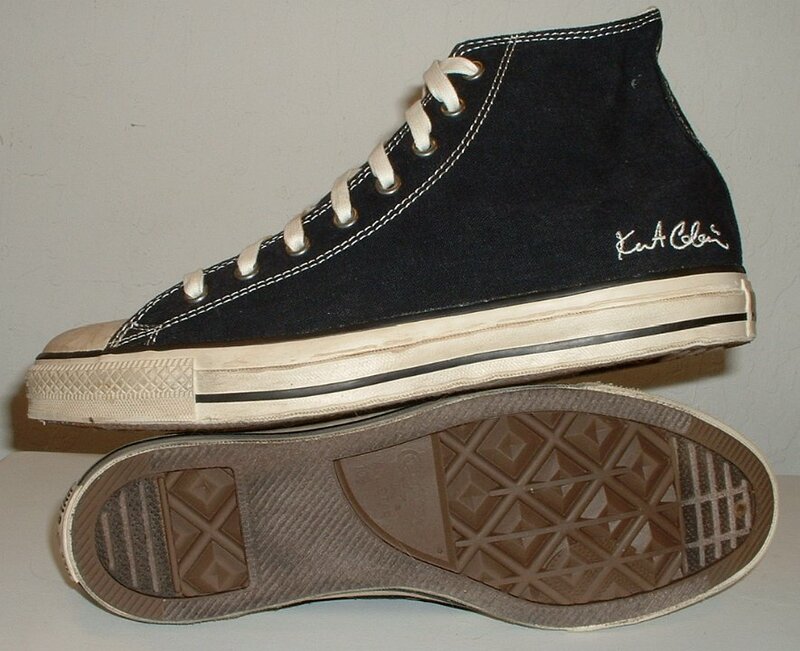 101 Rock and Roll High Top Chucks Kurt Cobain Signature high tops, outside views. 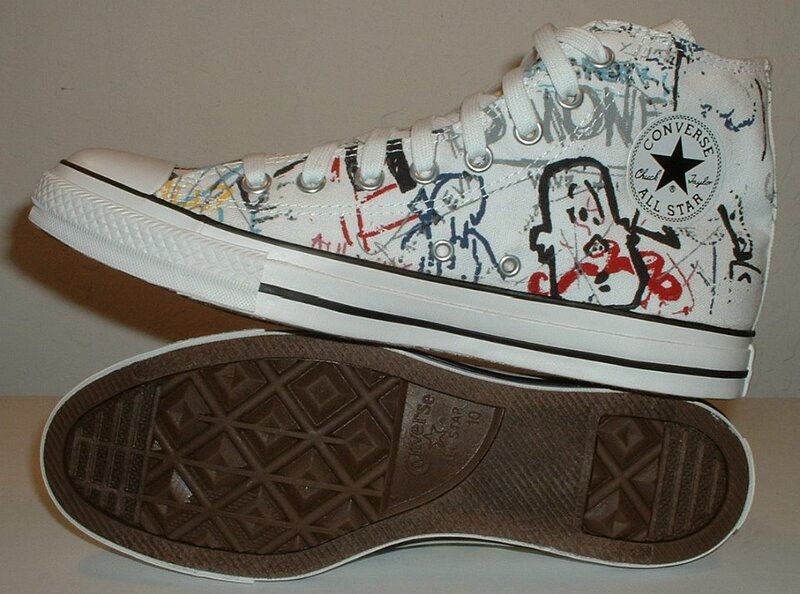 102 Rock and Roll High Top Chucks Kurt Cobain Signature high tops, inside patch and sole views. 103 Rock and Roll High Top Chucks Kurt Cobain Signature high tops, outside and sole views. 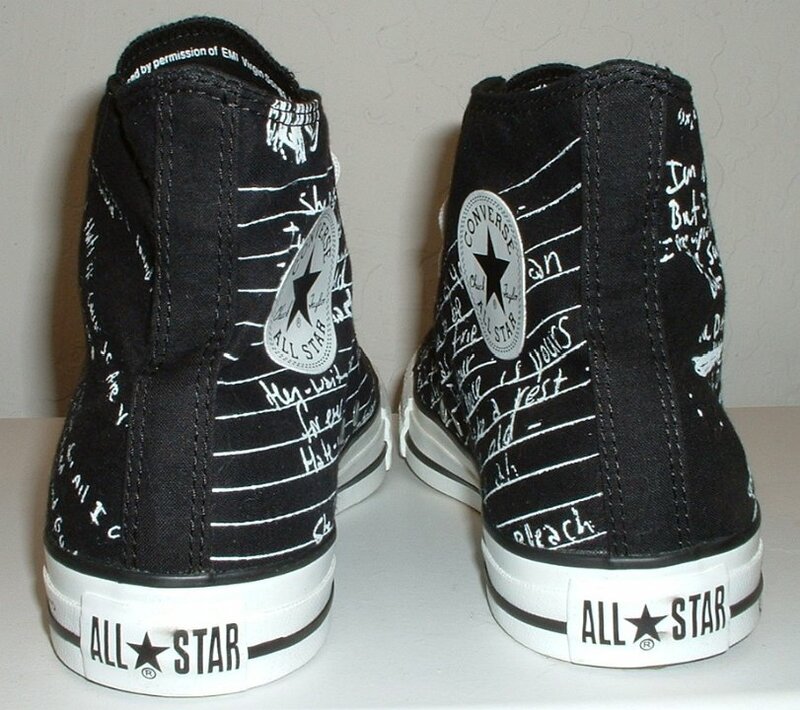 104 Rock and Roll High Top Chucks Kurt Cobain Signature high tops, inner sole view. 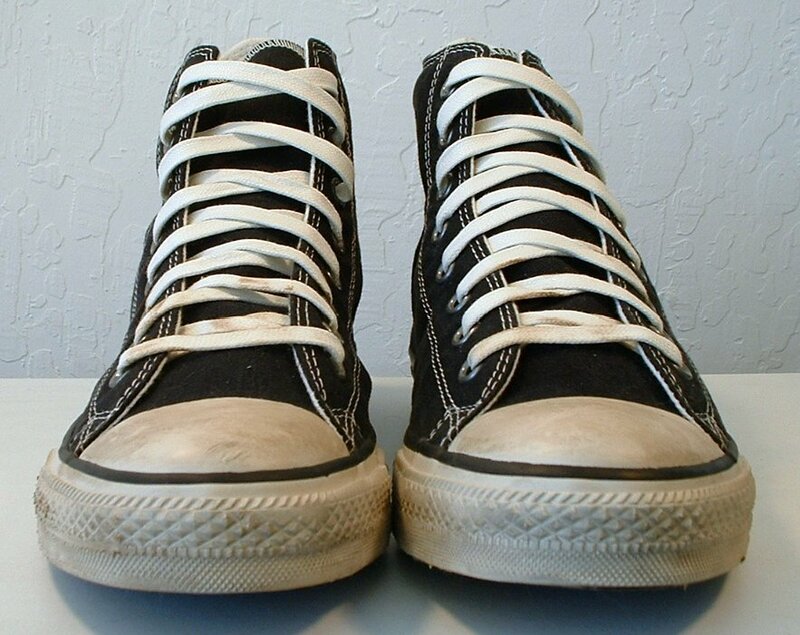 105 Rock and Roll High Top Chucks Outside view of a left Ramone's high top with hemp laces. 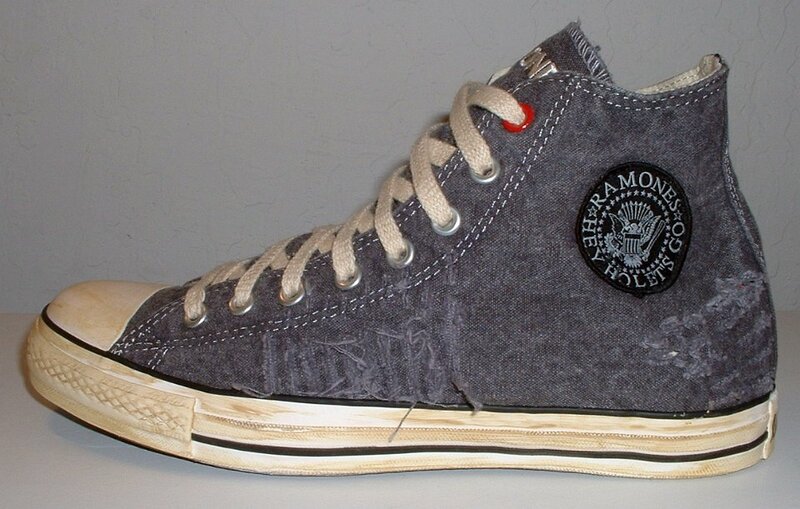 106 Rock and Roll High Top Chucks Inside patch view of a right Ramone's high top with hemp laces. 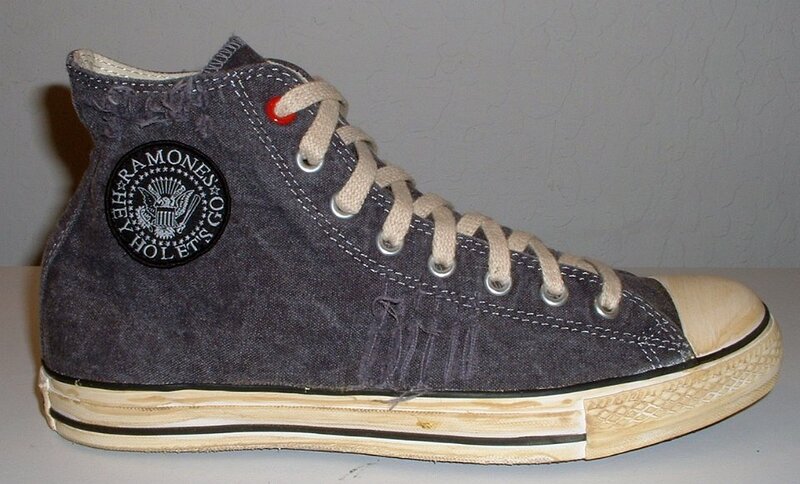 107 Rock and Roll High Top Chucks Inside patch view of a left Ramone's high top with hemp laces. 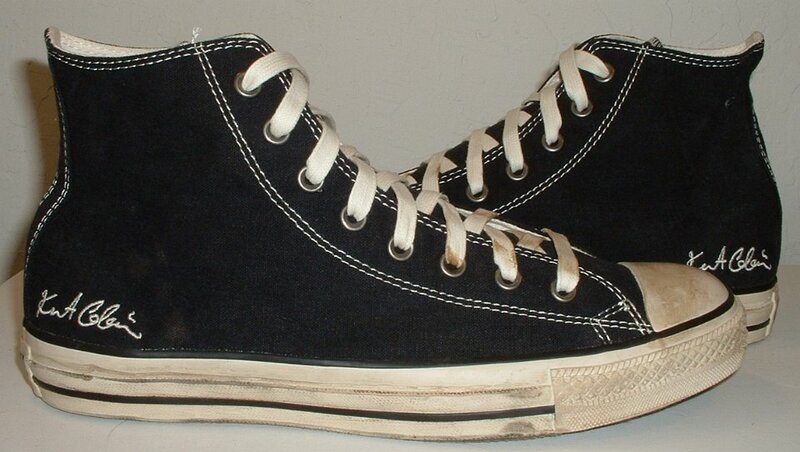 108 Rock and Roll High Top Chucks Outside view of a right Ramone's high top with hemp laces. 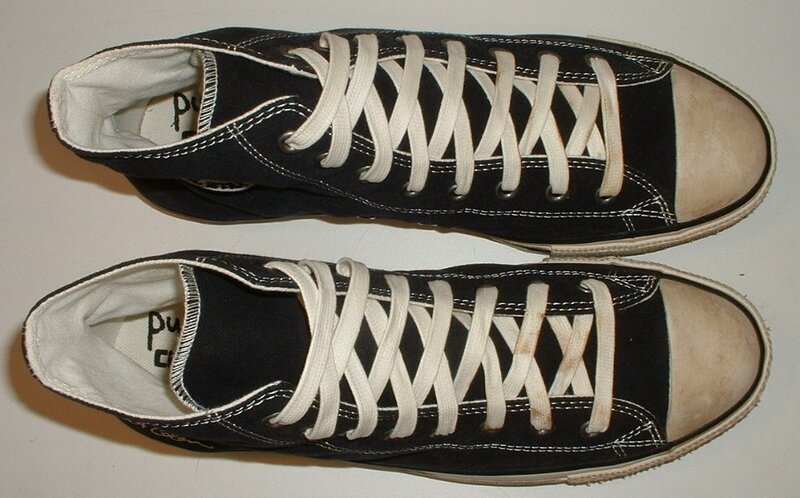 109 Rock and Roll High Top Chucks Rear view of Ramone's high tops with hemp laces. 110 Rock and Roll High Top Chucks Front view of Ramone's high tops with hemp laces. 111 Rock and Roll High Top Chucks Angled side view of Ramone's high tops with hemp laces. 112 Rock and Roll High Top Chucks Angled front view of Ramone's high tops with hemp laces. 113 Rock and Roll High Top Chucks Top view of Ramone's high tops with hemp laces. 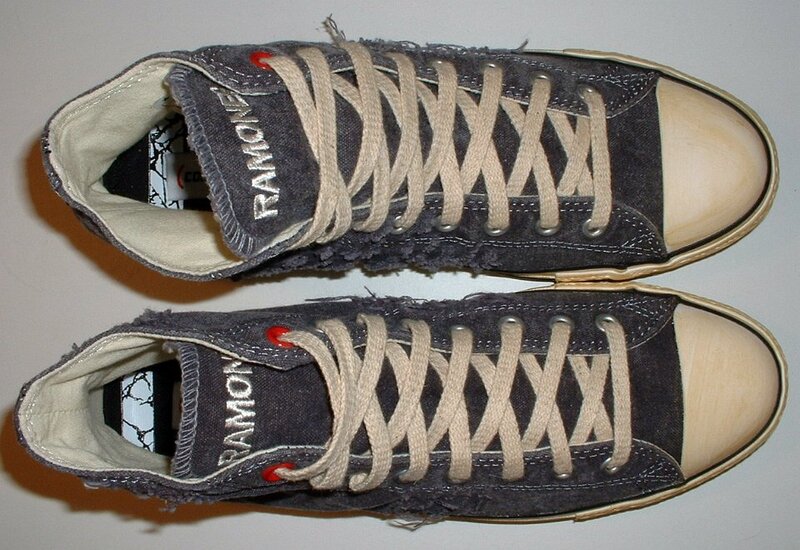 114 Rock and Roll High Top Chucks Inside patch views of Ramone's high tops with hemp laces. 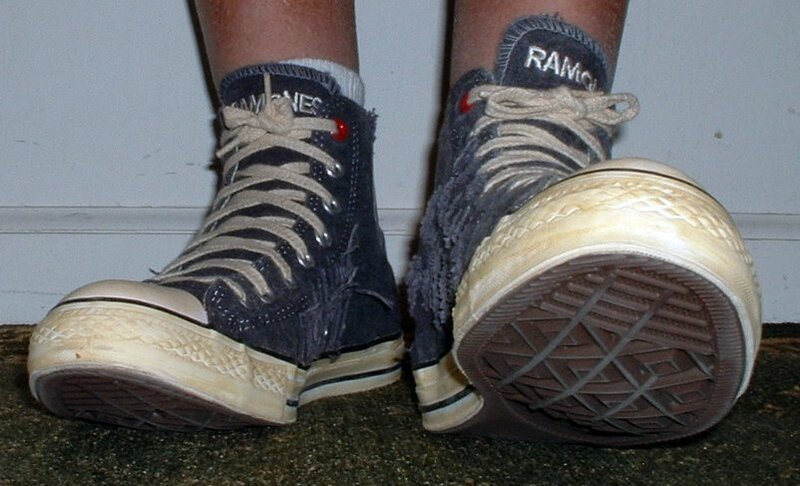 115 Rock and Roll High Top Chucks Outside patch views of Ramone's high tops with hemp laces. 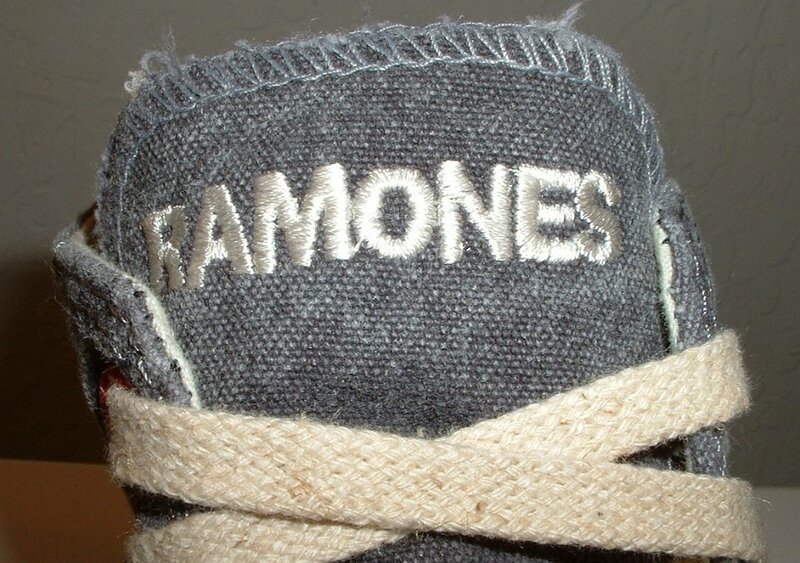 116 Rock and Roll High Top Chucks Closeup of the tongue of a Ramone's high top with hemp laces. 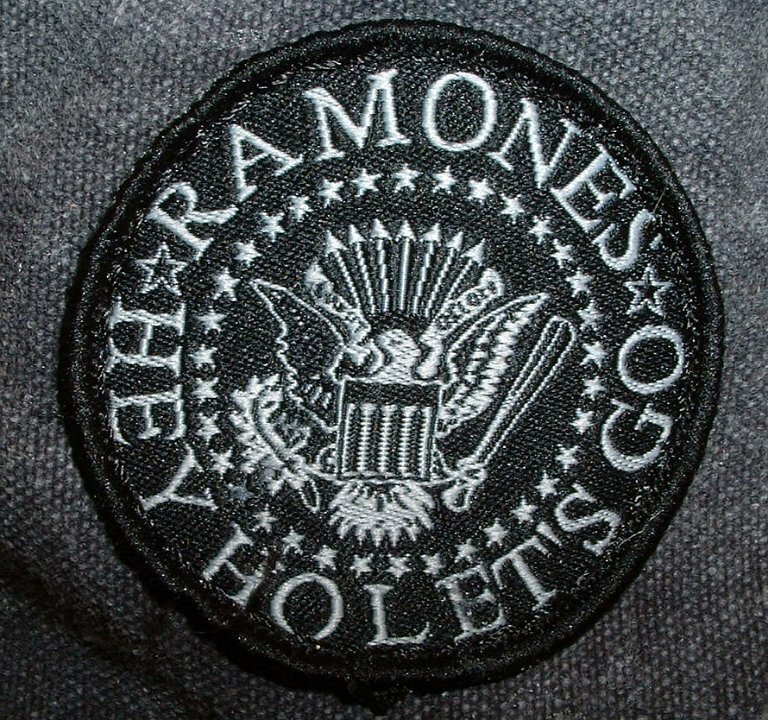 117 Rock and Roll High Top Chucks Closeup view of the outside patch on a Ramone's high top. 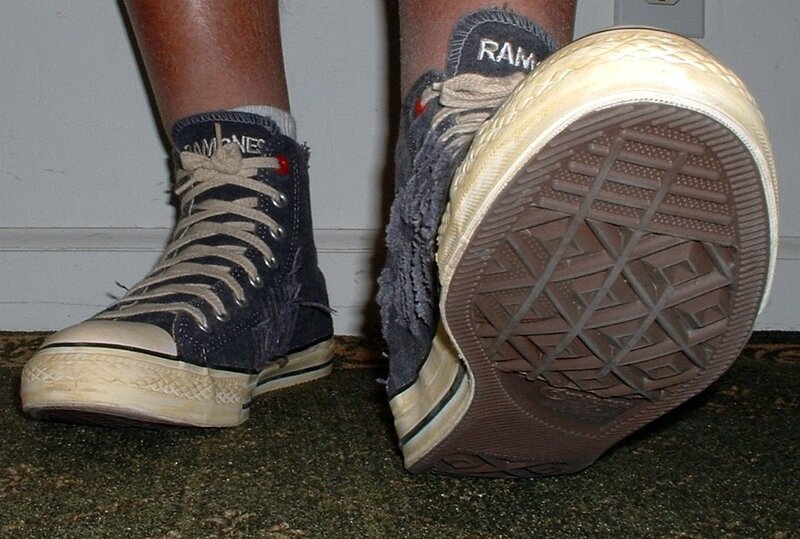 118 Rock and Roll High Top Chucks Outside patch and sole view of Ramone's high tops with hemp laces. 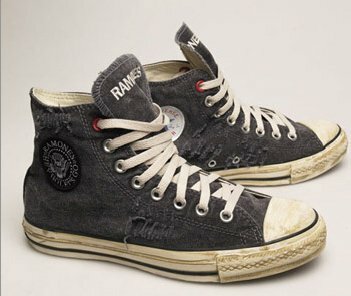 119 Rock and Roll High Top Chucks Inside patch and sole views of Ramone's high tops with hemp laces. 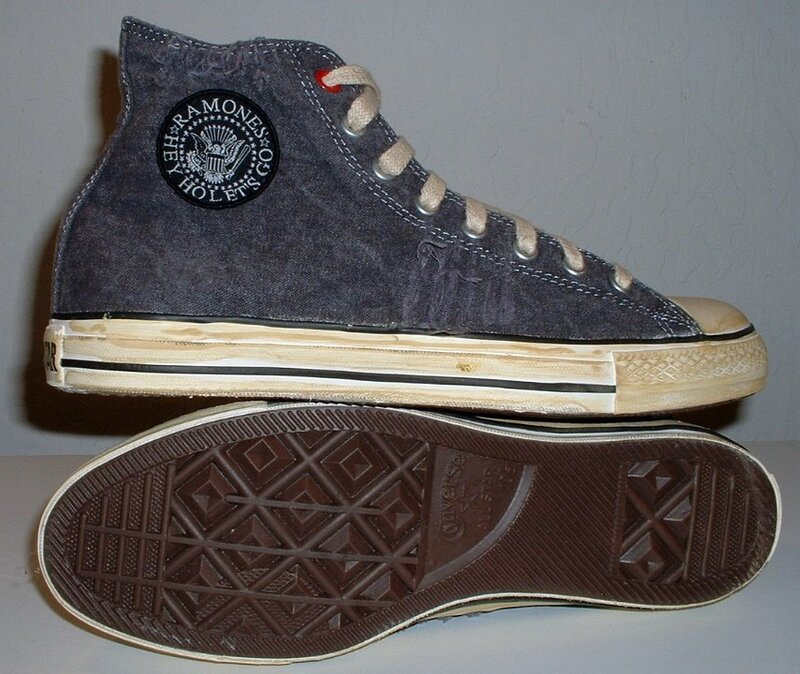 120 Rock and Roll High Top Chucks Inner sole view of a Ramone's high top. The lettering says "Let's Go". 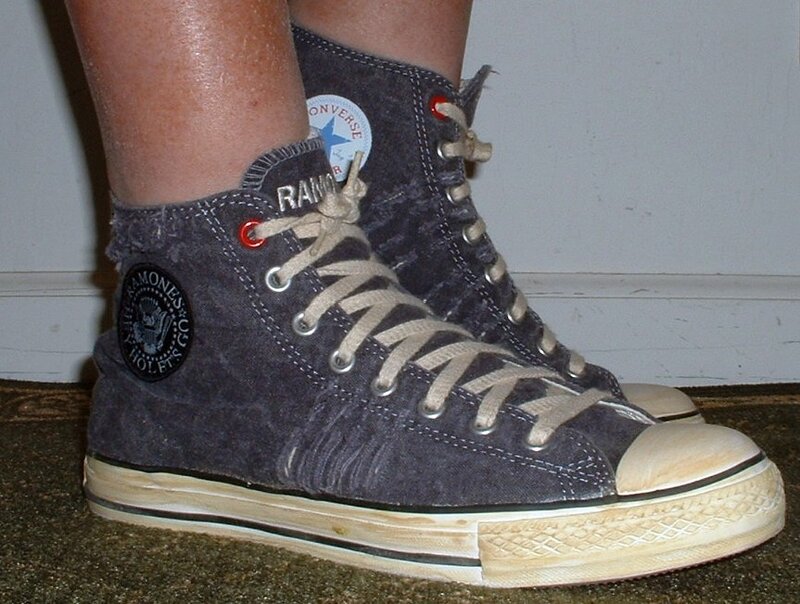 121 Rock and Roll High Top Chucks Stepping out in a pair of Ramone's high tops with hemp laces, front view 1. 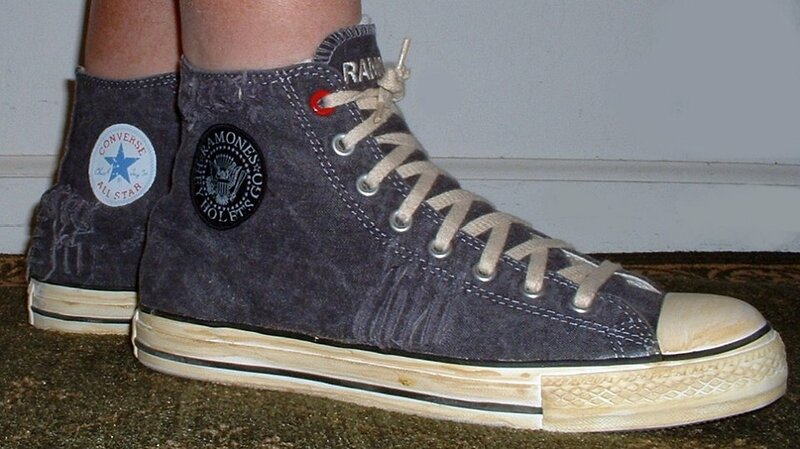 122 Rock and Roll High Top Chucks Stepping out in a pair of Ramone's high tops with hemp laces, front view 2. 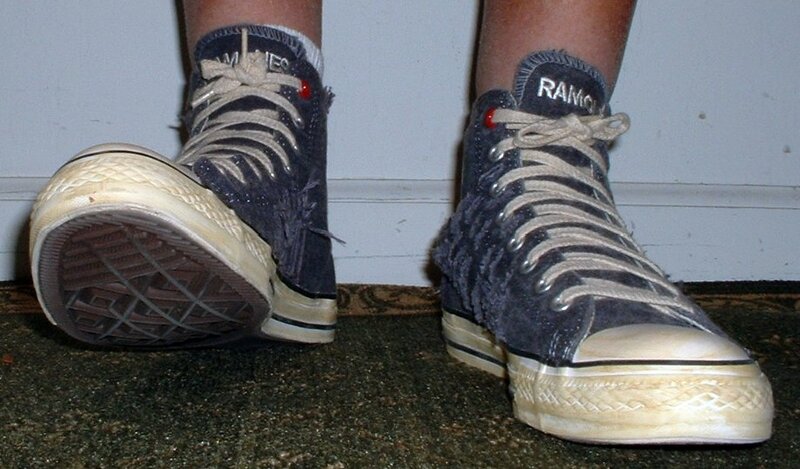 123 Rock and Roll High Top Chucks Stepping out in a pair of Ramone's high tops with hemp laces, front view 3. 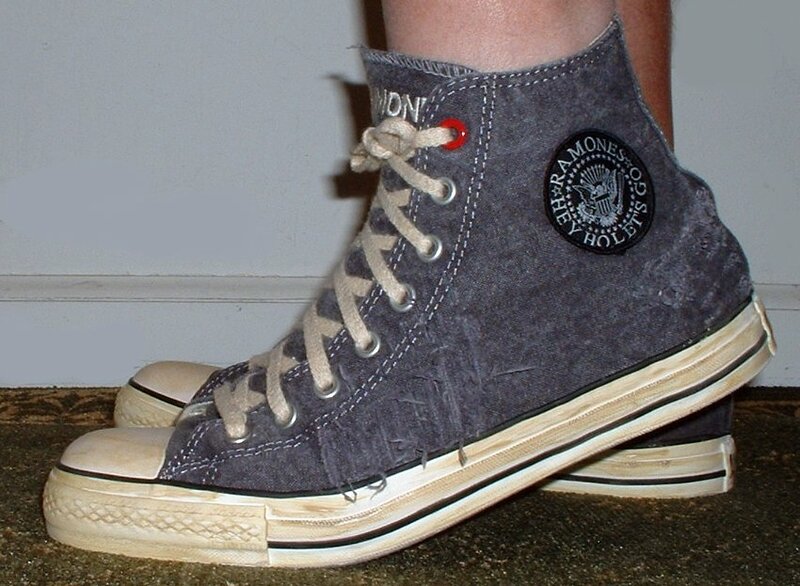 124 Rock and Roll High Top Chucks Standing in a pair of Ramone's high tops with hemp laces, front view 4. 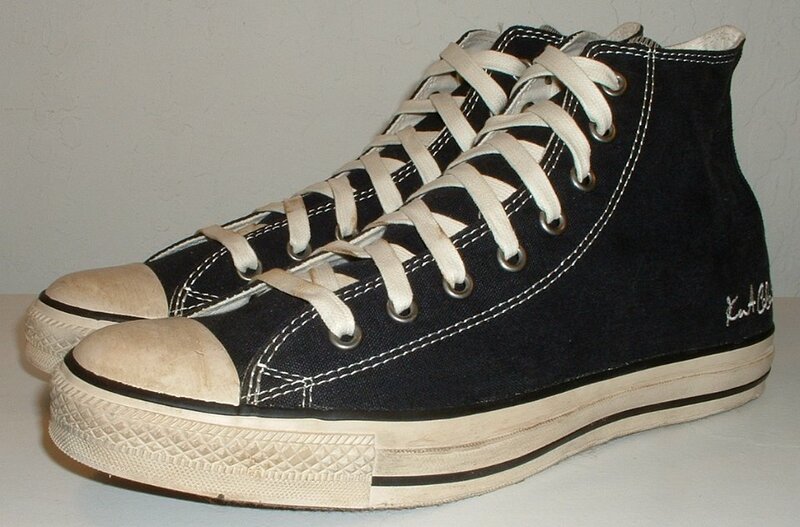 125 Rock and Roll High Top Chucks Stepping out in a pair of Ramone's high tops with hemp laces, left side view 1. 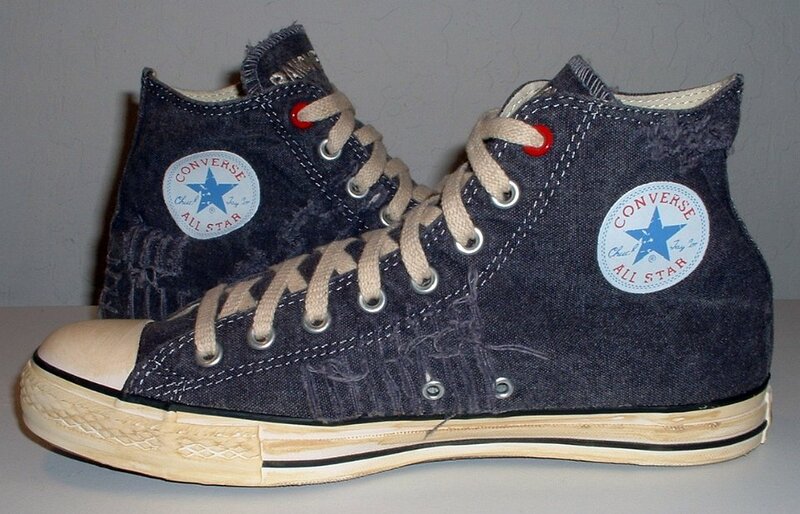 126 Rock and Roll High Top Chucks Stepping up in a pair of Ramone's high tops with hemp laces, left side view 2. 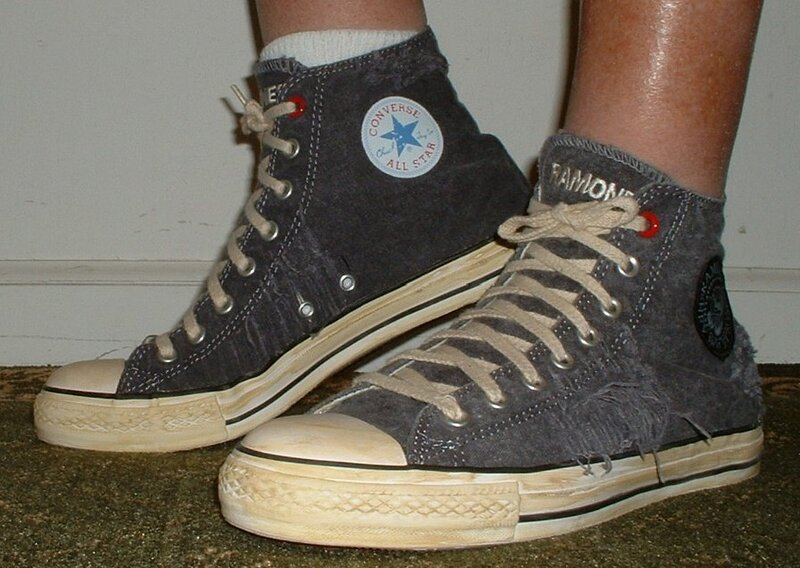 127 Rock and Roll High Top Chucks Stepping out in a pair of Ramone's high tops with hemp laces, rear view 1. 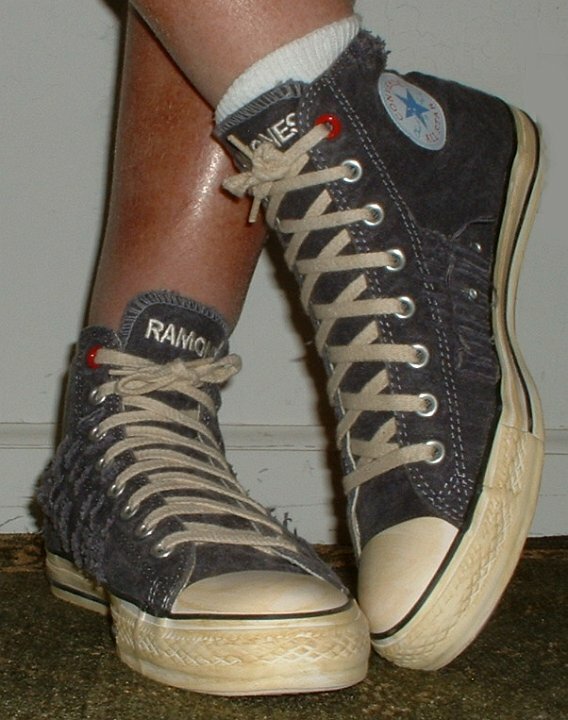 128 Rock and Roll High Top Chucks Stepping out in a pair of Ramone's high tops with hemp laces, rear view 2. 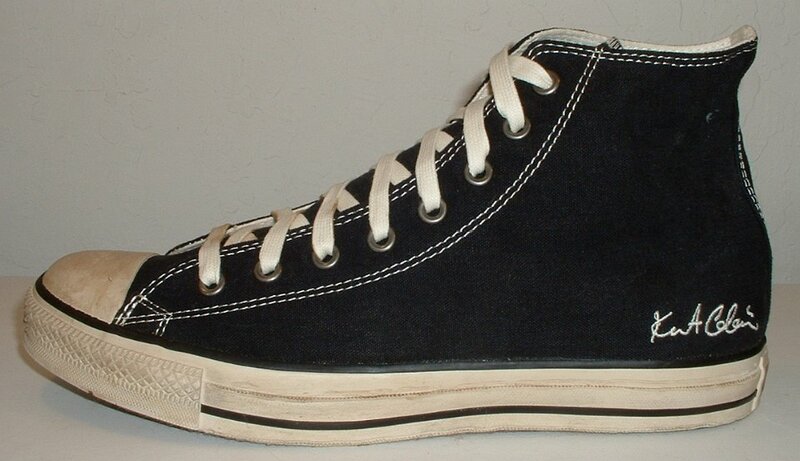 129 Rock and Roll High Top Chucks Stepping out in a pair of Ramone's high tops with hemp laces, right side view 1. 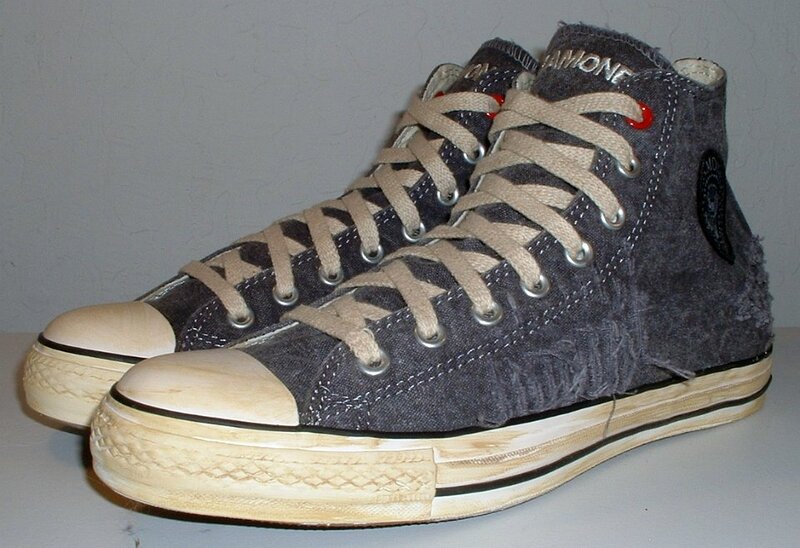 130 Rock and Roll High Top Chucks Standing in a pair of Ramone's high tops with hemp laces, right side view 2. 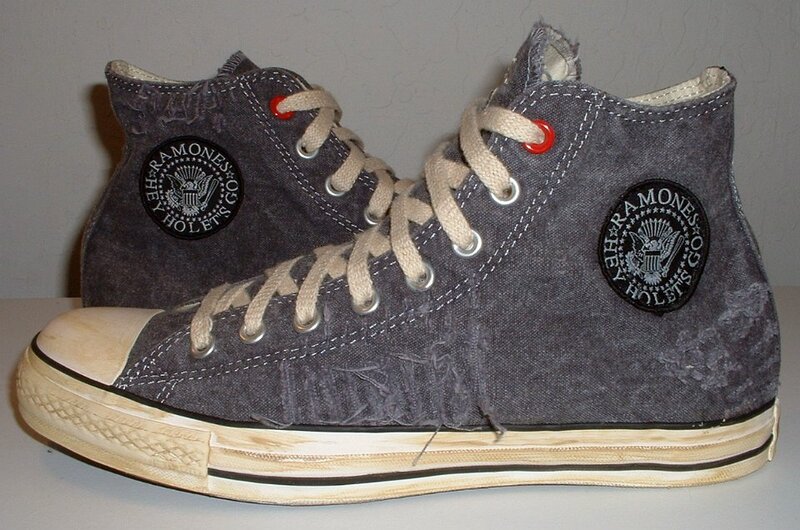 131 Rock and Roll High Top Chucks Outside patch and angled rear view of Ramone's high tops with hemp laces. 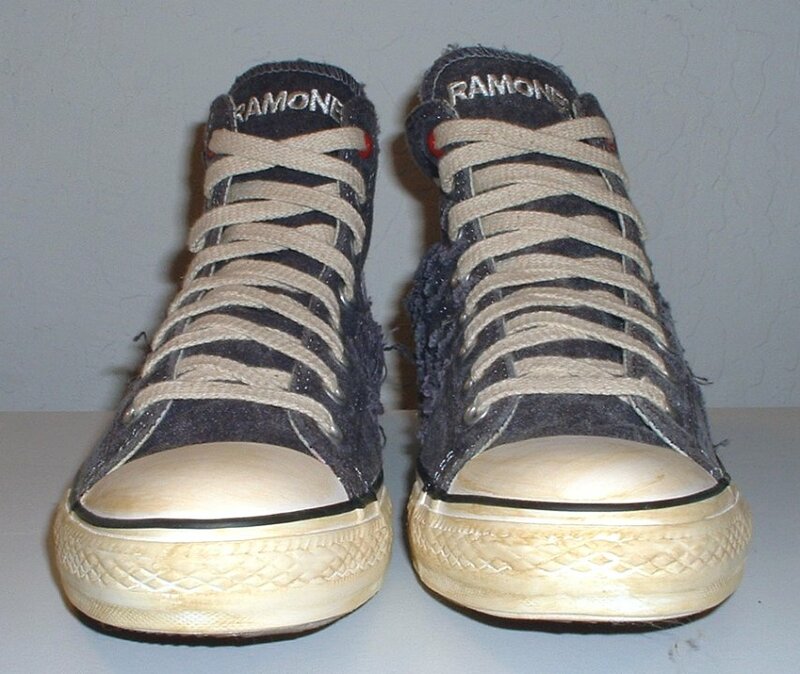 132 Rock and Roll High Top Chucks Right side view of Ramone's high tops with hemp laces. 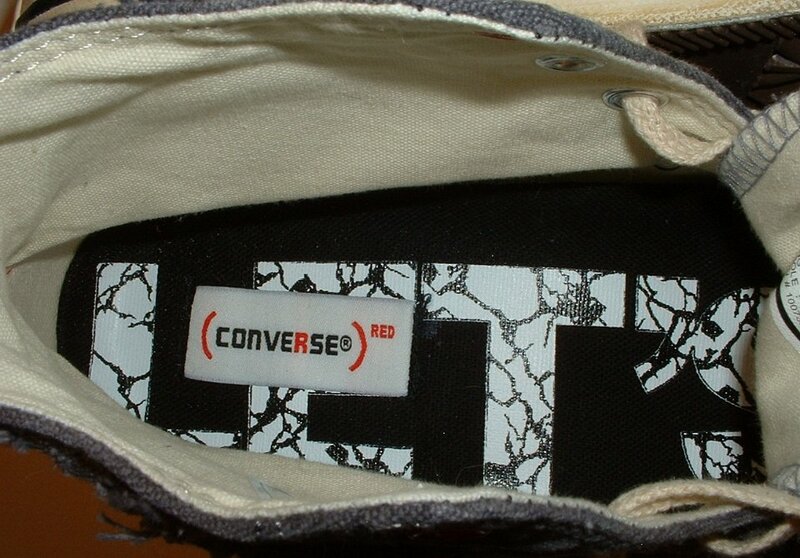 133 Rock and Roll High Top Chucks Closeup of the Convdrse tags that come with various rock and roll line shoes. 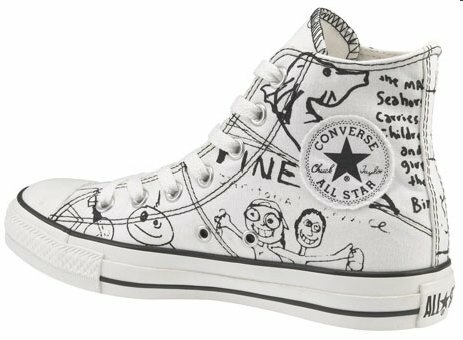 134 Rock and Roll High Top Chucks Right Kurt Cobain white doodles high, outside view. 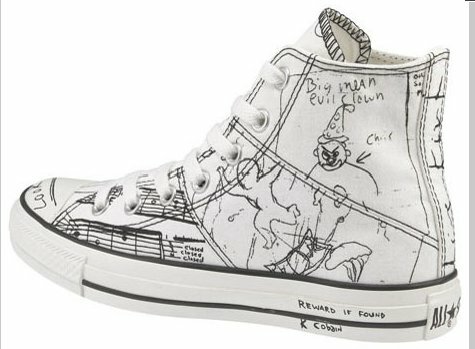 135 Rock and Roll High Top Chucks Left Kurt Cobain white doodles high, outside view. 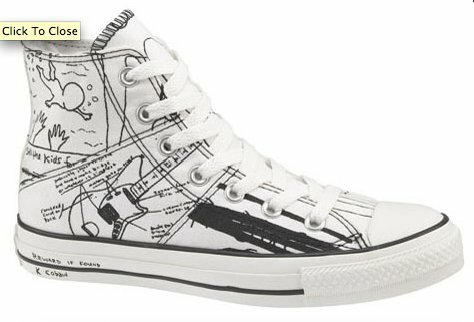 136 Rock and Roll High Top Chucks Right Kurt Cobain white doodles high, inside patch view. 137 Rock and Roll High Top Chucks Inside patch view of a right white punk print high top. 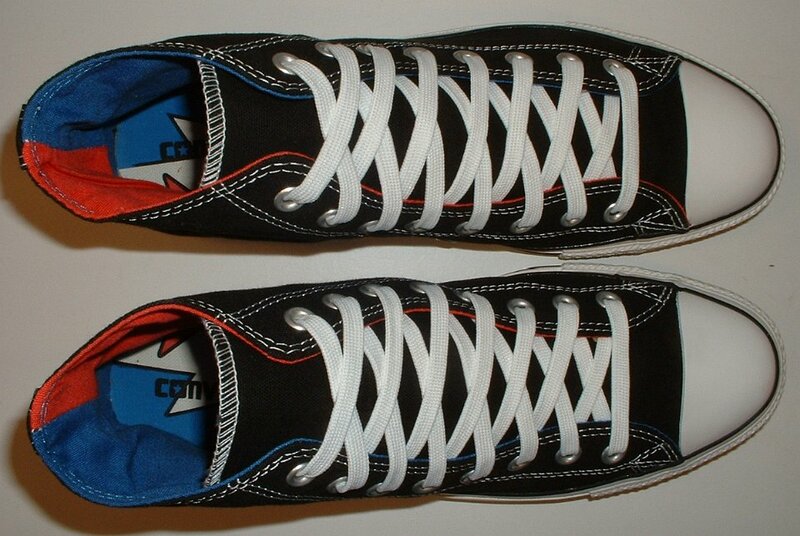 138 Rock and Roll High Top Chucks Outside view of a right white punk print high top. 139 Rock and Roll High Top Chucks Inside patch view of a left white punk print high top. 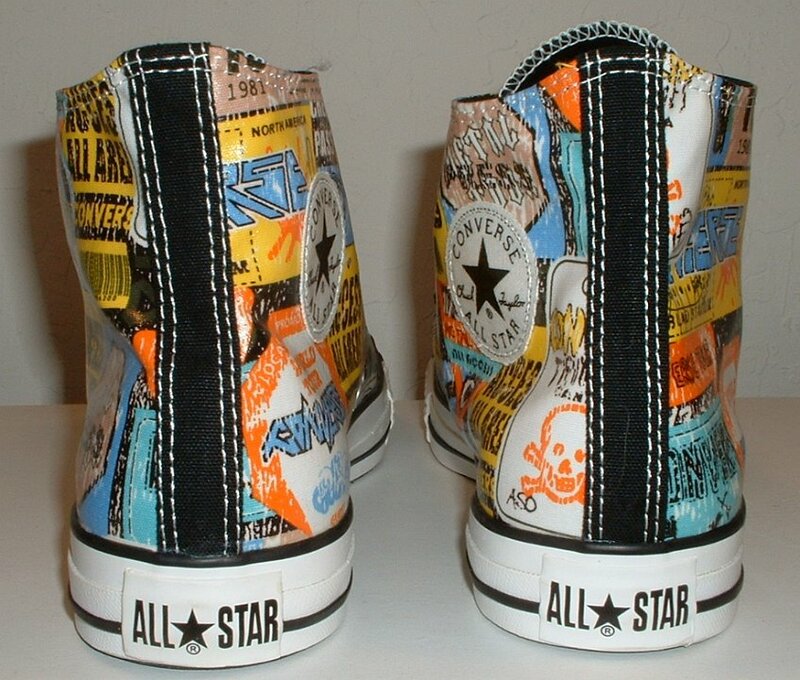 140 Rock and Roll High Top Chucks Outside view of a left white punk print high top. 141 Rock and Roll High Top Chucks Rear view of white punk print high tops. 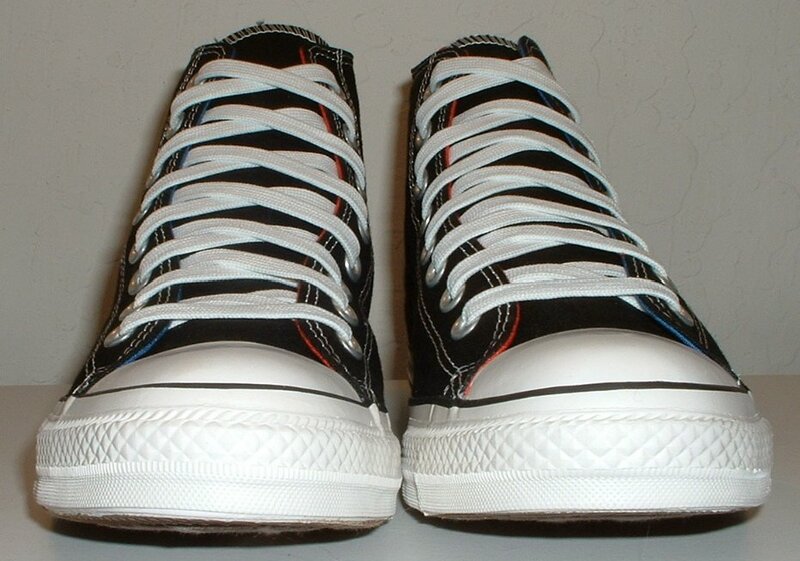 142 Rock and Roll High Top Chucks Angled rear view of white punk print high tops. 143 Rock and Roll High Top Chucks Angled side view of white punk print high tops. 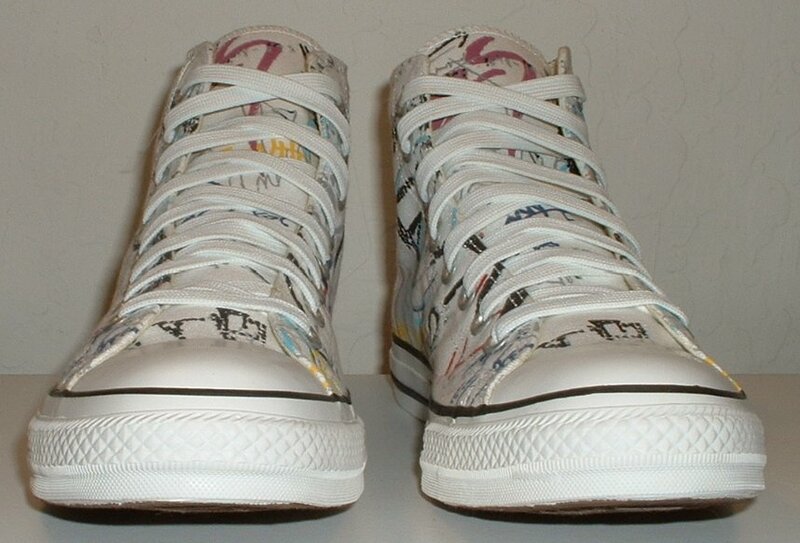 144 Rock and Roll High Top Chucks Front view of white punk print high tops. 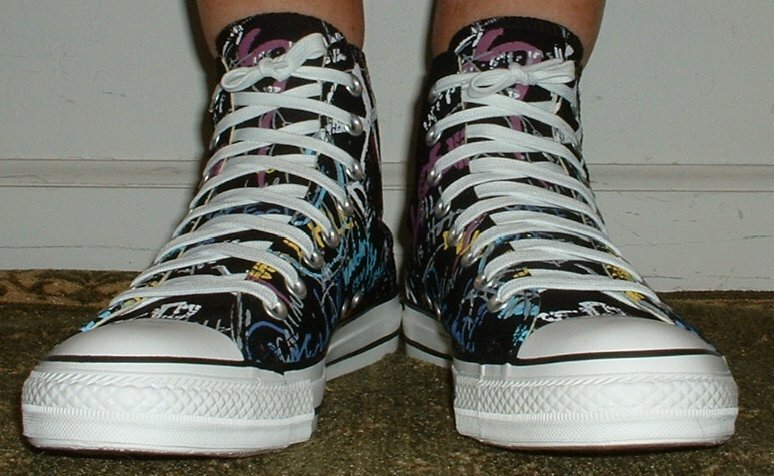 145 Rock and Roll High Top Chucks Angled front view of white punk print high tops. 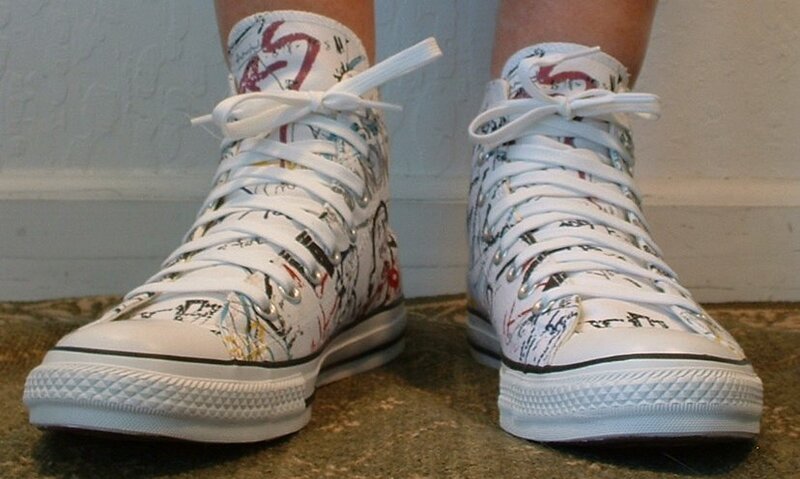 146 Rock and Roll High Top Chucks Top view of white punk print high tops. 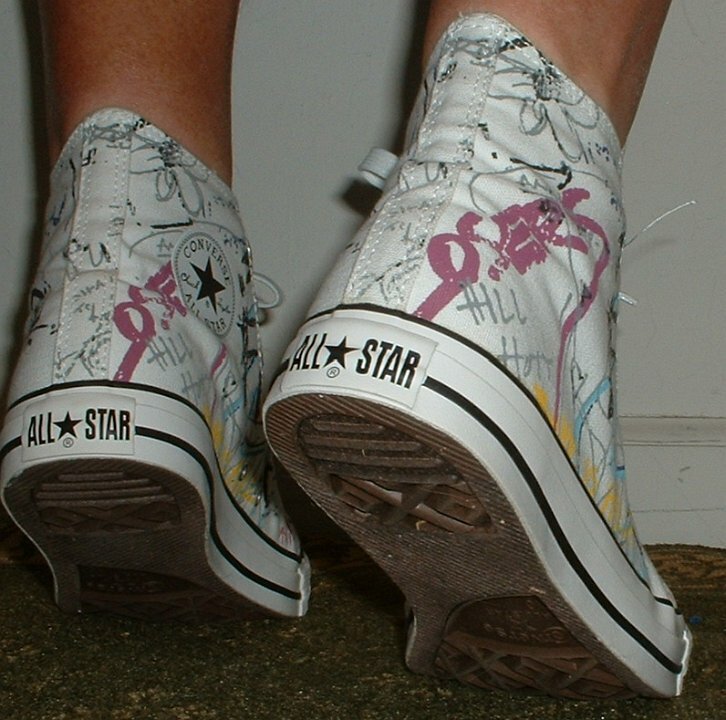 147 Rock and Roll High Top Chucks Inside patch views of white punk print high tops. 148 Rock and Roll High Top Chucks Outside views of white punk print high tops. 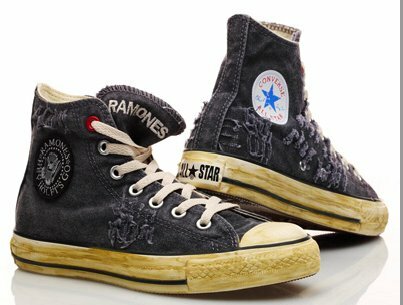 149 Rock and Roll High Top Chucks Inside patch and outer sole views of white punk print high tops. 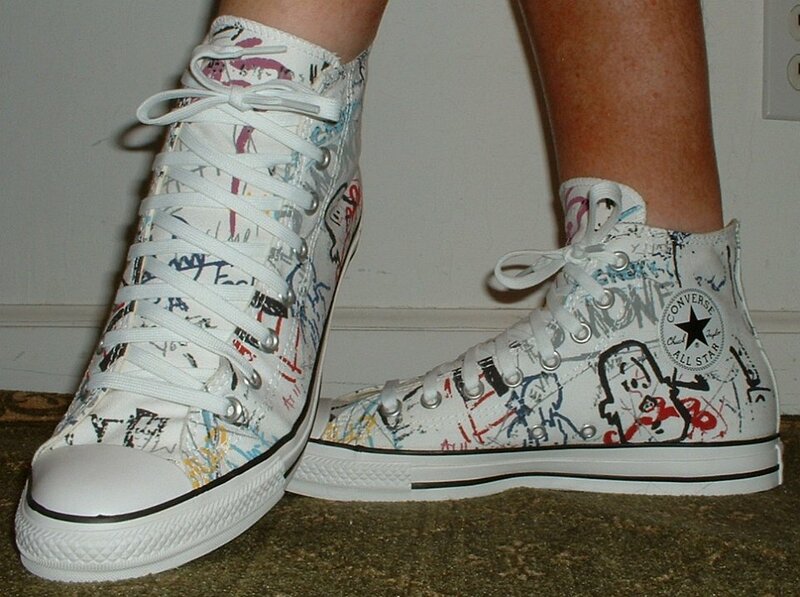 150 Rock and Roll High Top Chucks Wearing white punk print high tops, front view 1. 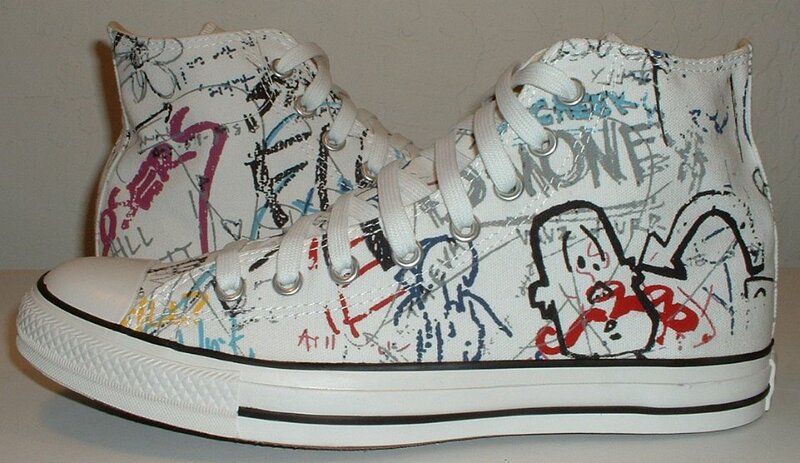 151 Rock and Roll High Top Chucks Wearing white punk print high tops, front view 2. 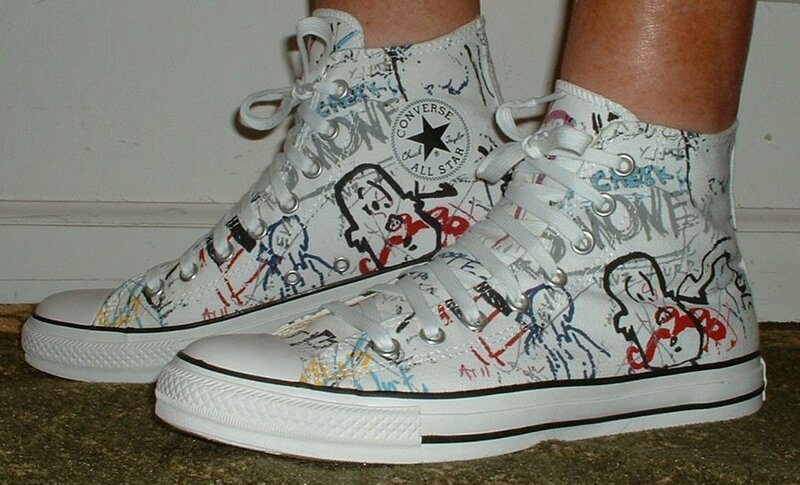 152 Rock and Roll High Top Chucks Wearing white punk print high tops, front view 3. 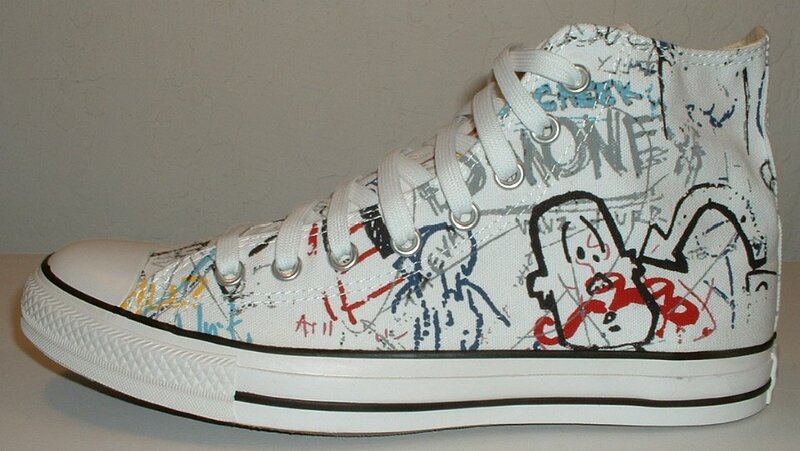 153 Rock and Roll High Top Chucks Wearing white punk print high tops, right side view 1. 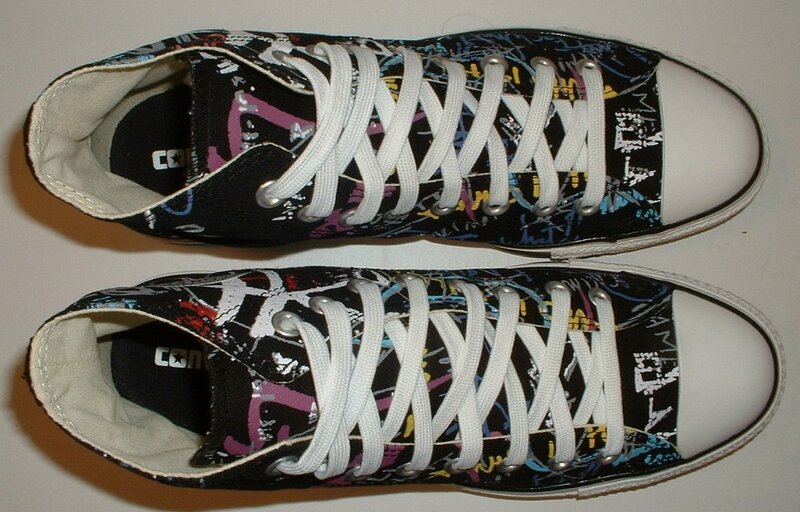 154 Rock and Roll High Top Chucks Wearing white punk print high tops, right side view 2. 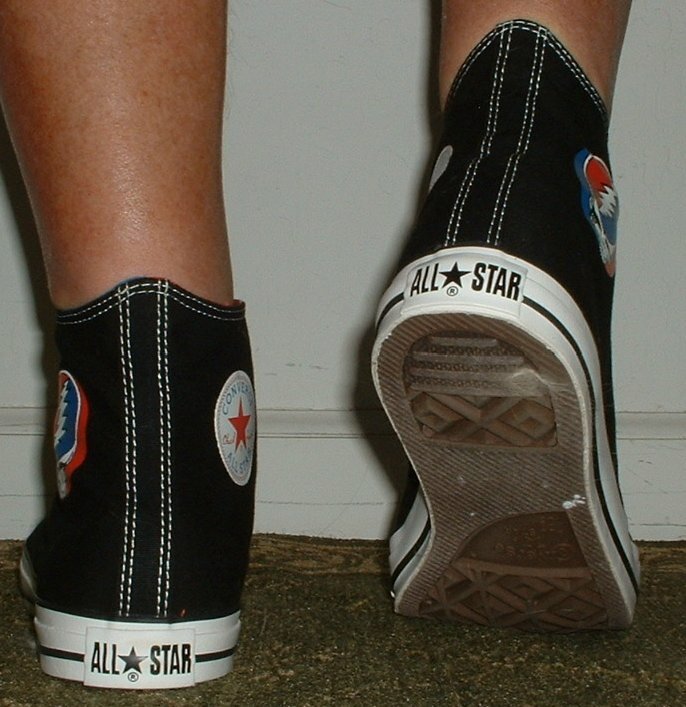 155 Rock and Roll High Top Chucks Wearing white punk print high tops, rear view 1. 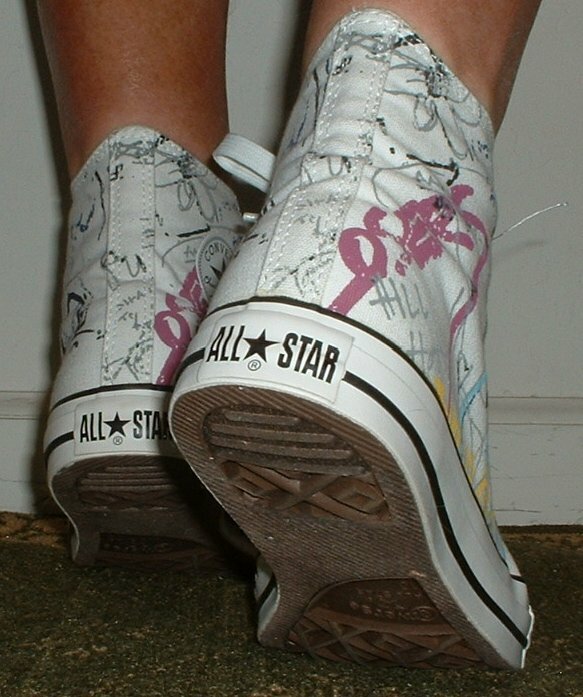 156 Rock and Roll High Top Chucks Wearing white punk print high tops, rear view 2. 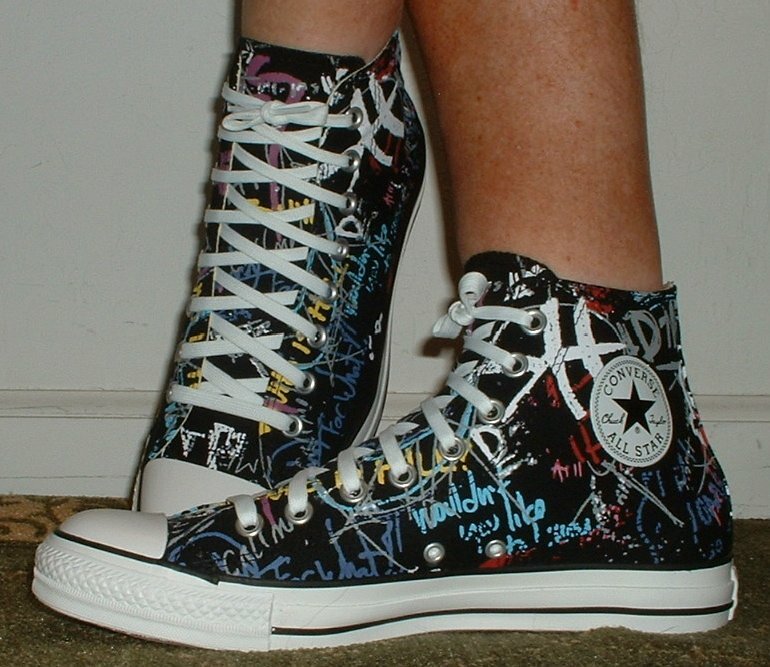 157 Rock and Roll High Top Chucks Wearing white punk print high tops, rear view 3. 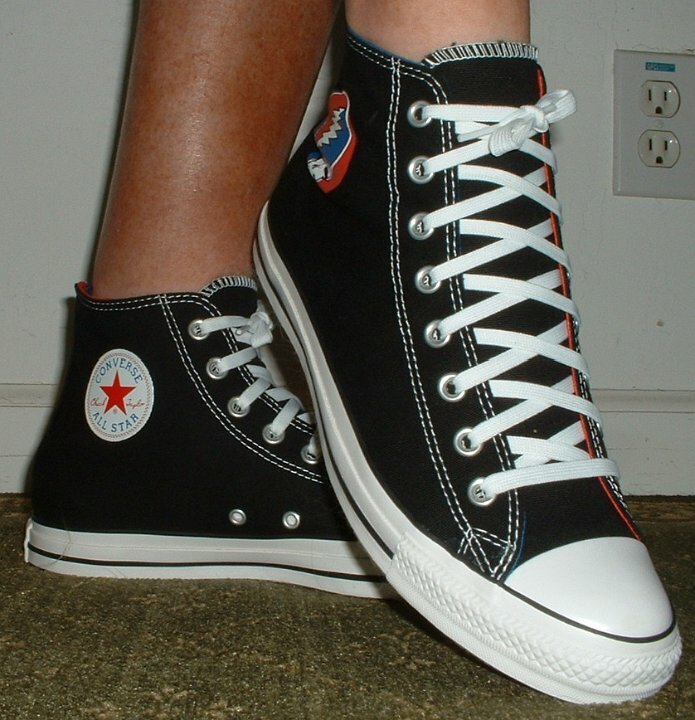 158 Rock and Roll High Top Chucks Wearing white punk print high tops, rear view 4. 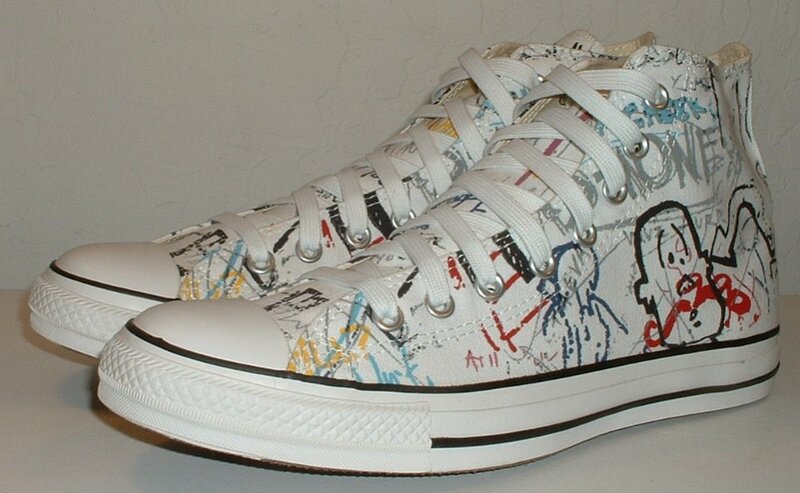 159 Rock and Roll High Top Chucks Wearing white punk print high tops, left side view 1. 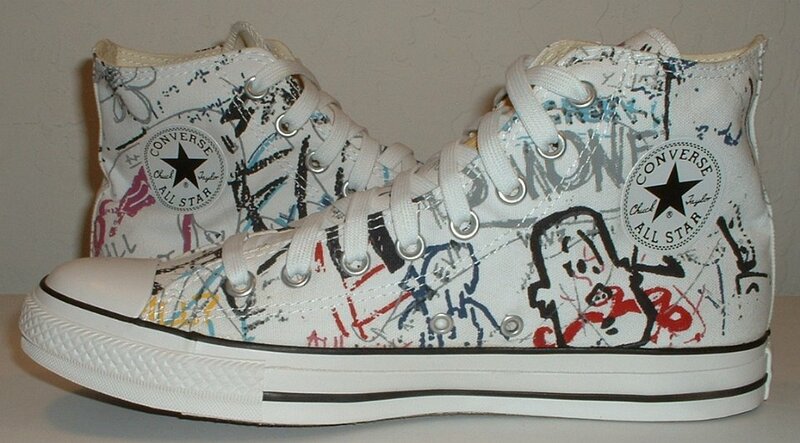 160 Rock and Roll High Top Chucks Wearing white punk print high tops, left side view 2. 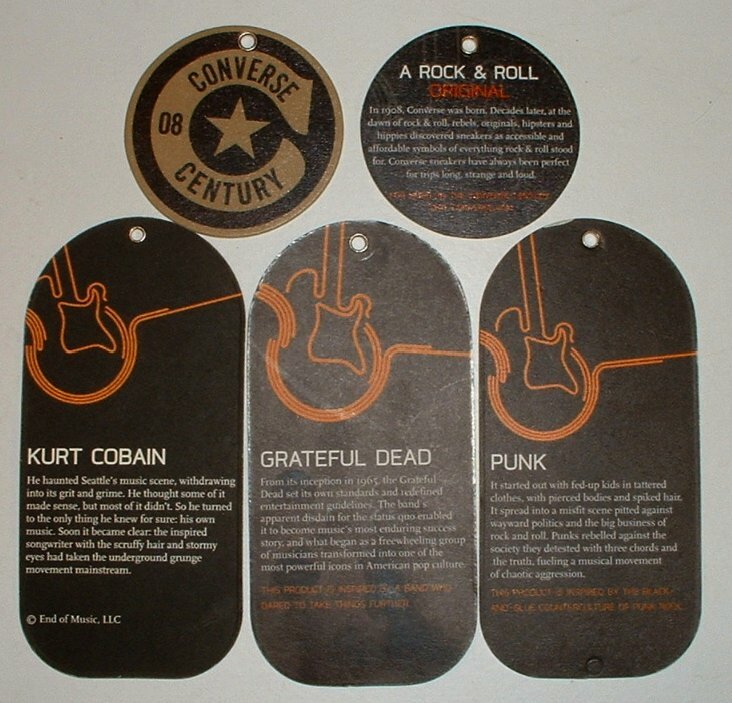 As part of their Converse Century Project, the company has been issuing models of chucks that pay tribute to specific rock and roll musicans or groups, and the overall culture of rock. 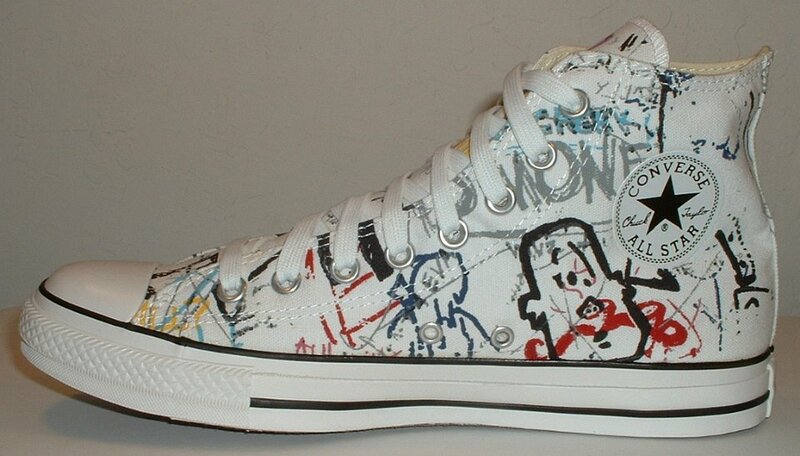 Recent models have included a line of Grateful Dead shoes, several Kurt Cobain model high tops, a product Red distressed black Ramones high top, and different prints like the coated color backstage pass, and punk prints on black and white canvas. The shoes come with special tags also.